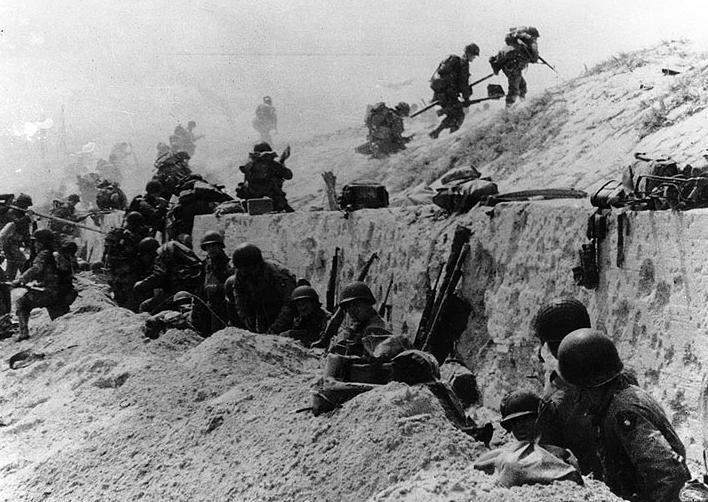 Sandwiched between tall bluffs on either end, a five-mile stretch of Normandy coastline was designated Omaha Beach near the center of the Allied D-Day landings on June 6th, 1944. 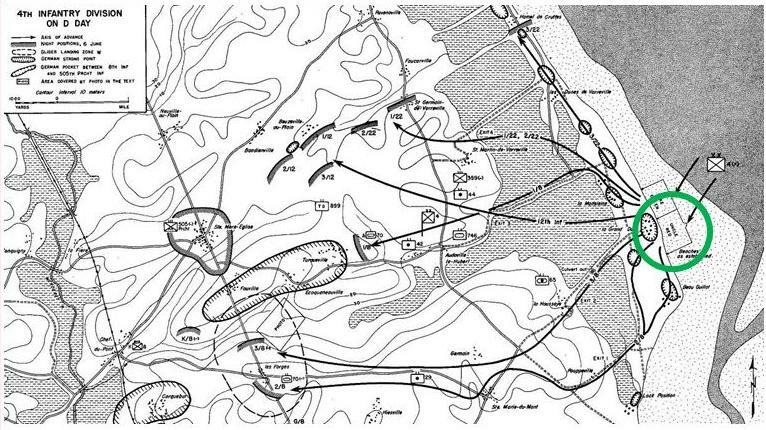 Landing at Omaha was the relatively fresh US 29th Infantry Division. 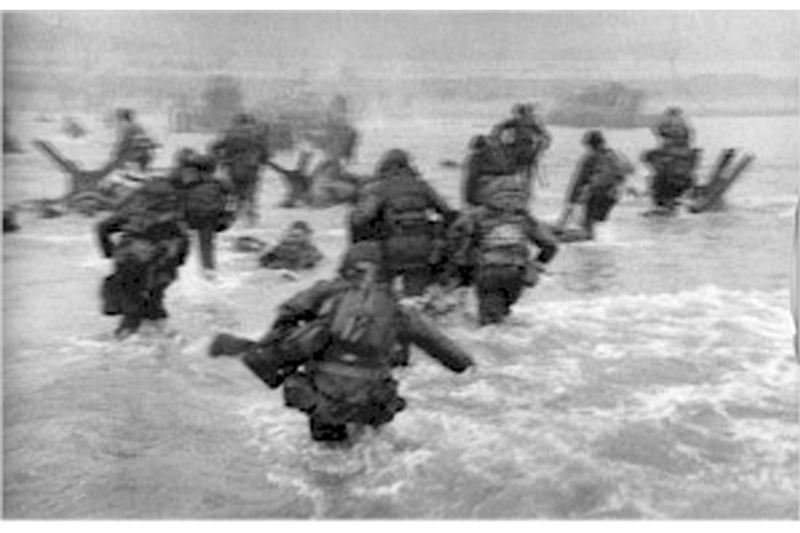 With British and Canadian troops landing on beaches to the left and other US men landing at Omaha Beach to the right, the 40,000 Americans at Omaha met with the highest rate of casualties of the day with some 3,000 falling in the French surf and sand. 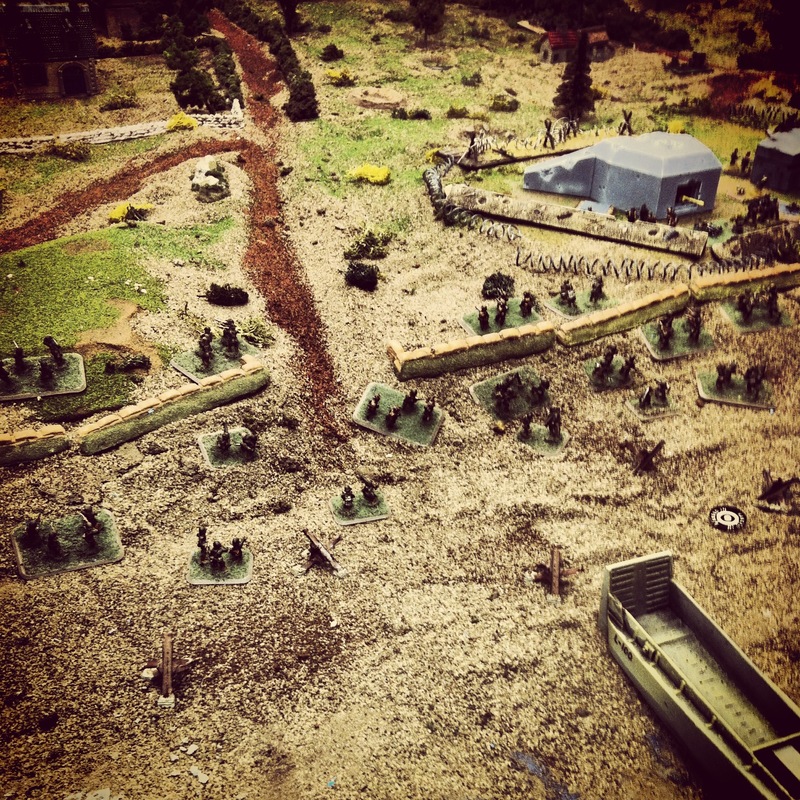 Lying in wait at Omaha was a mix of green recruits and older veterans in the German 352nd Infantry Division. 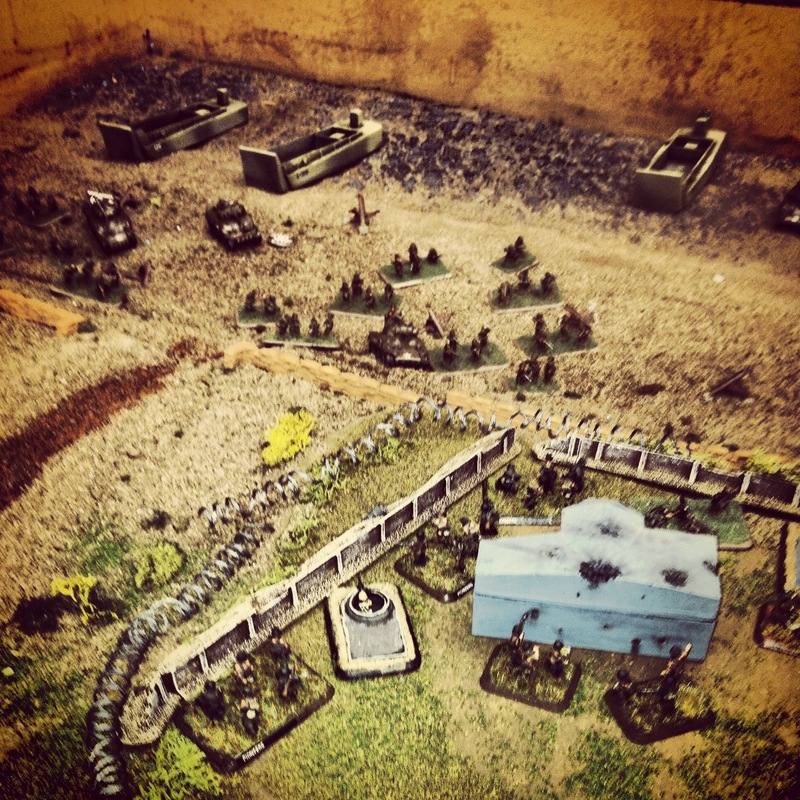 Dug in at the coast in a wall of pillboxes, bunkers, gun pits and trenches, the German men (and unknown number of boys) met the US invaders with a storm of machine gun, artillery, mortar and rocket fire. For the US, little went right as landing craft drifted off course and special floating DD M4 Sherman tanks were swamped and sank offshore. 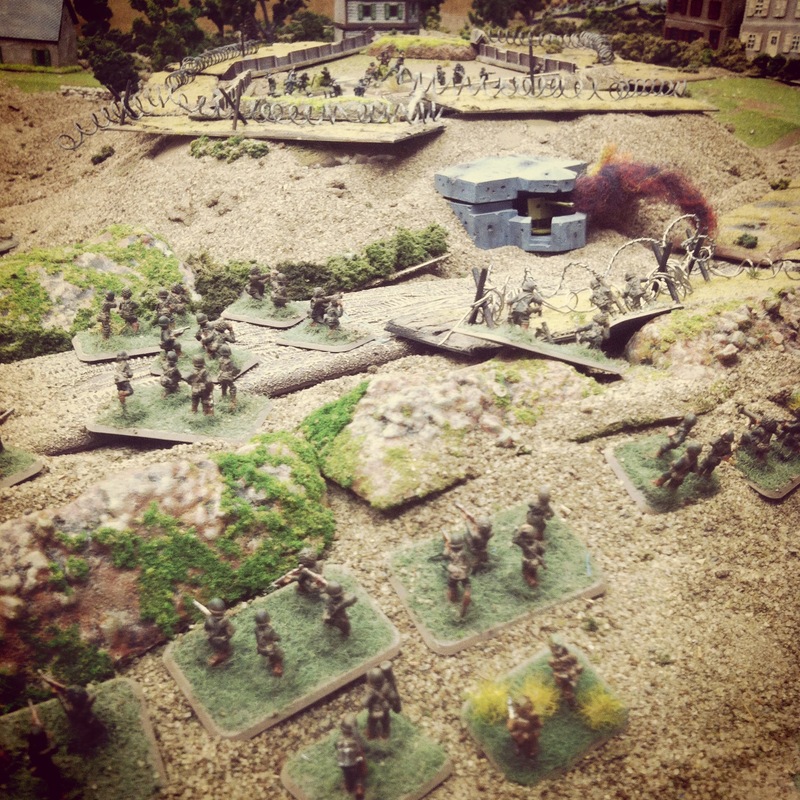 Only through improvised efforts and a slow, methodical pace under withering fire did the American infantry finally make it through the German lines to control the beach by the close of the day. 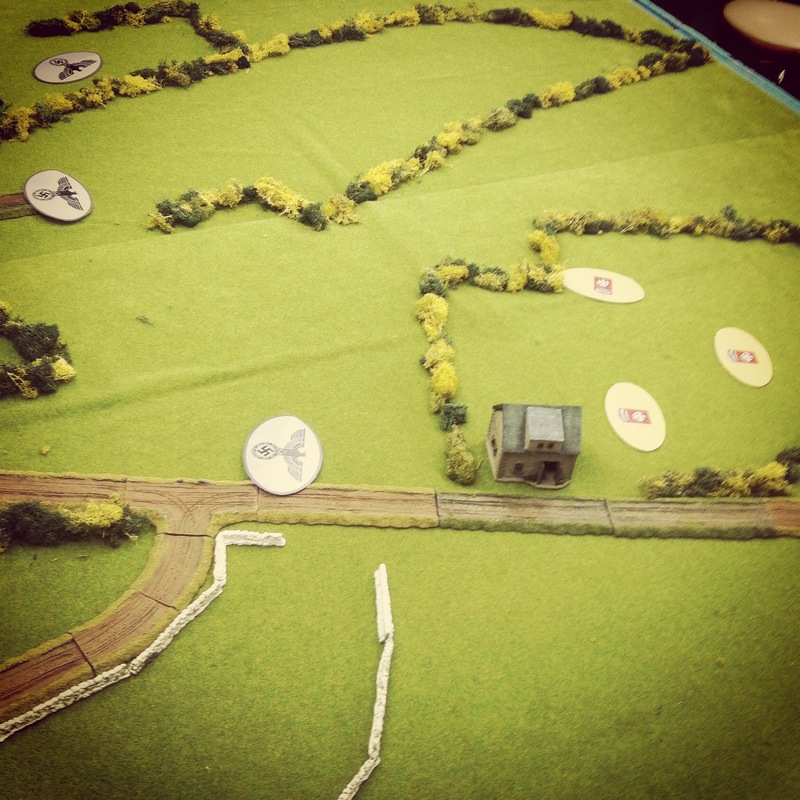 In preparation for our upcoming D-Day Plus 70 weekend at Metropolitan Wargamers in Brooklyn, NY on June 6th-8th, a couple of us have been playing out beach landing practice games. 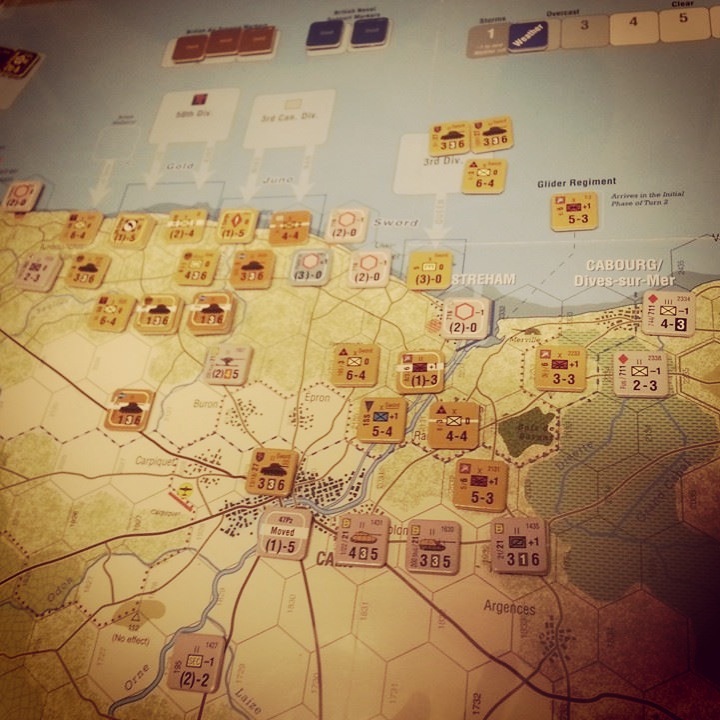 Flames of War offers a specific outline for coastal assaults with their “Hit The Beach” rules, but we’ve found them to be very difficult to play with US invaders losing more often than not. 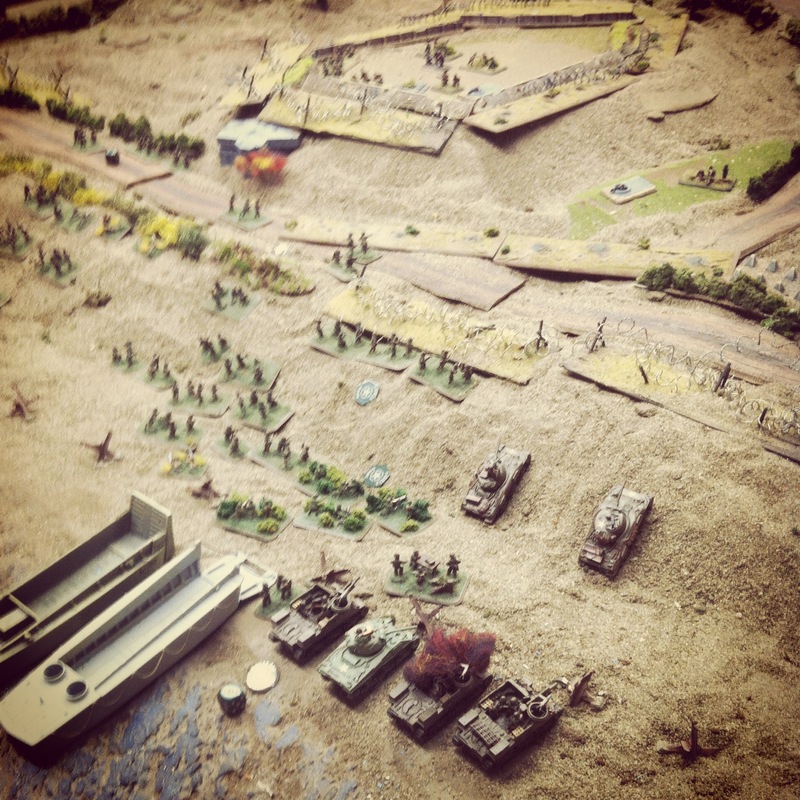 Last summer we ran through our first beach landing on one of the club’s sand tables with a Utah Beach “Easy Red” scenario in which the US failed horribly. 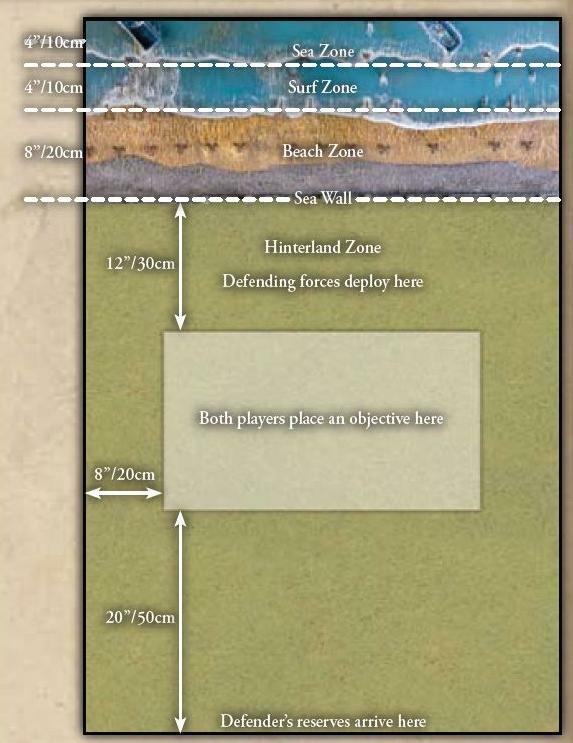 Since then we’ve been studying up, tweaking our forces and diving deep into the particular rules for a tabletop beach landing game. 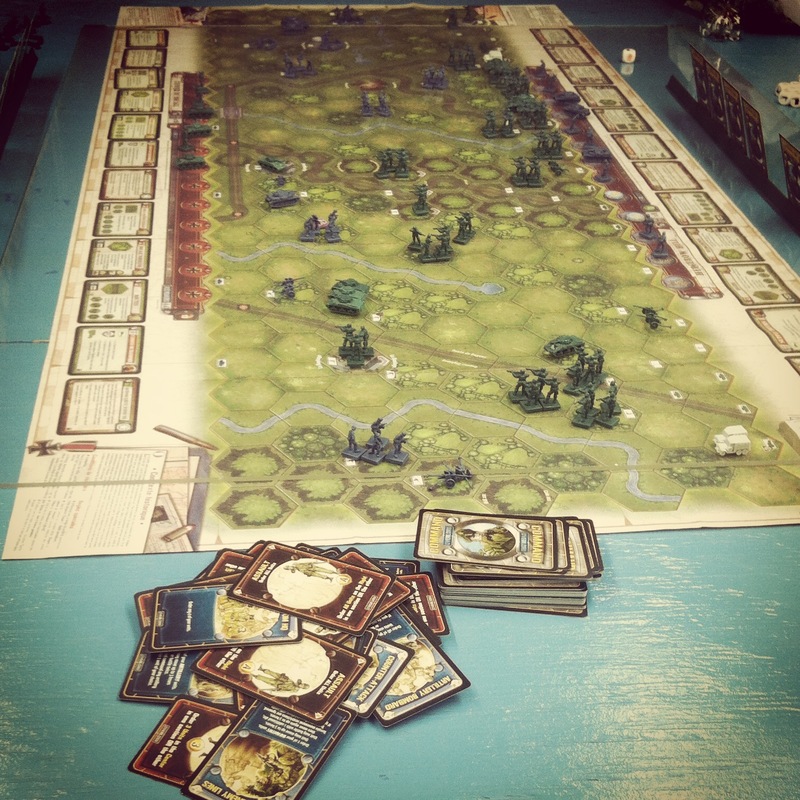 This past week we ran through the Omaha Beach “Easy Green” scenario to what was probably our most evenly matched and played game to date. 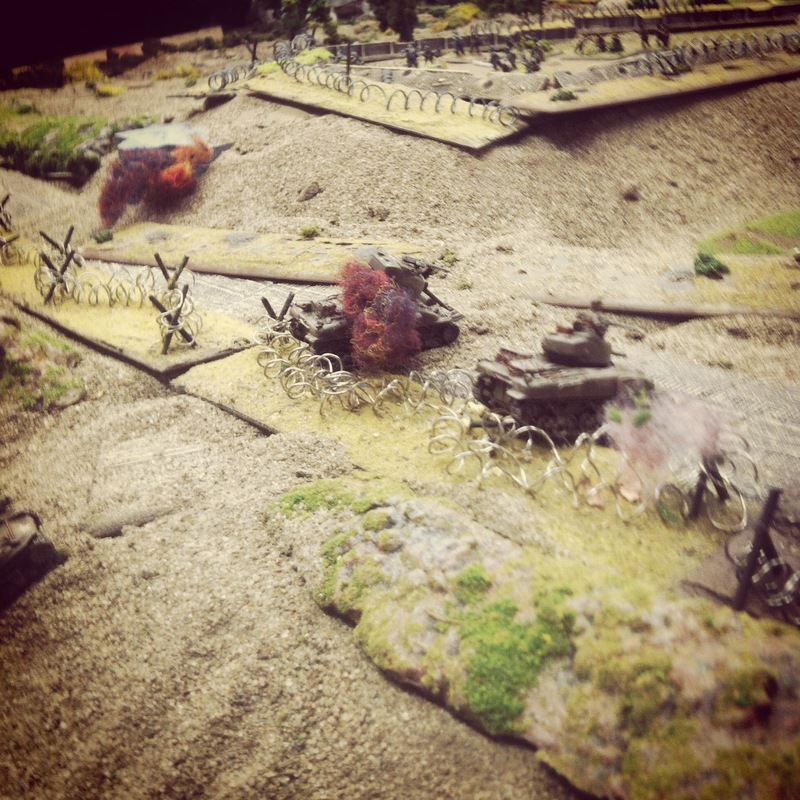 The scenario sticks pretty closely to the situation at Easy Green with one beach exit road guarded by lines of barbed wire, trenches, mines and anti-tank obstacles. 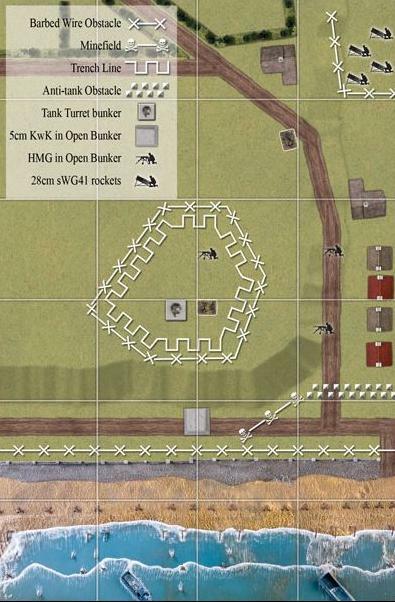 Finally, a combined defense of heavy machine guns, a 5 cm KwK 39 gun bunkered at the coast and Nebelwerfer rockets at the rear provide a daunting nut for the US infantry to crack. 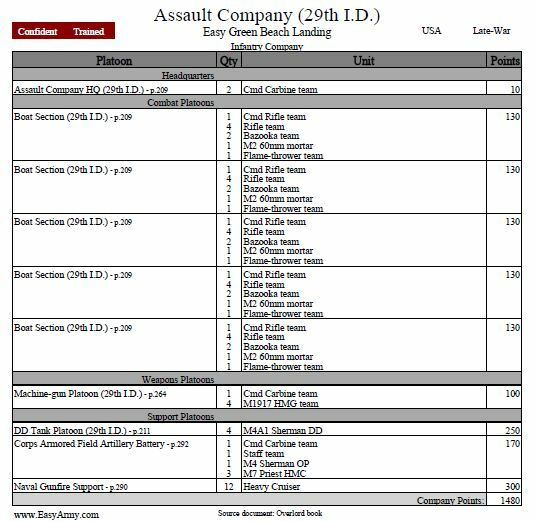 For our game, my German opponent was able to field forces as outlined in the published FOW scenario but I had to modify my American list slightly to fit my model collection. 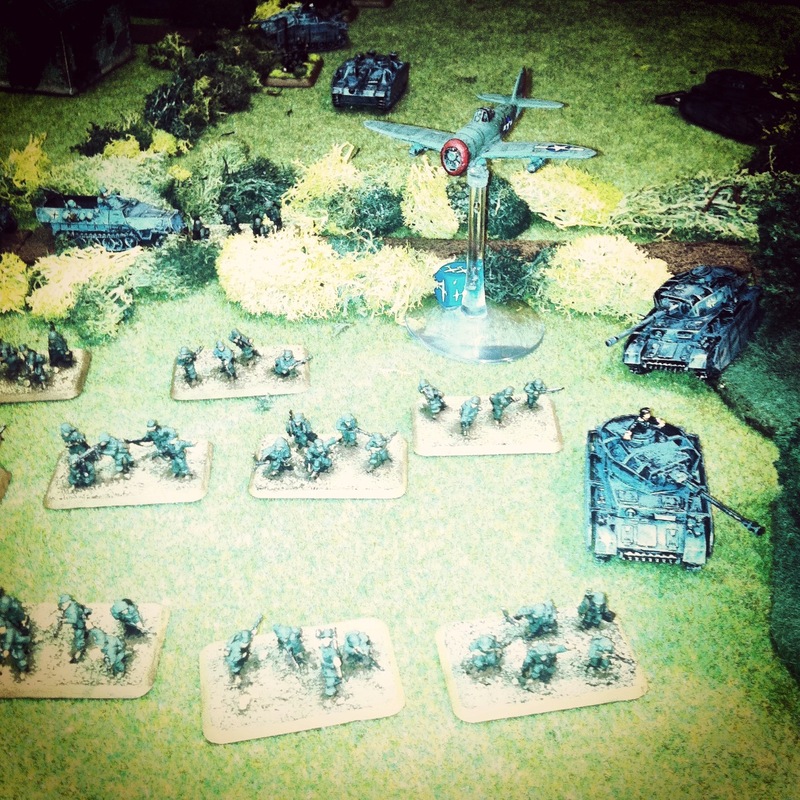 Even with slight changes, our final lists had the US at a few more points stronger than the Germans as per the mission outline and the game rules. 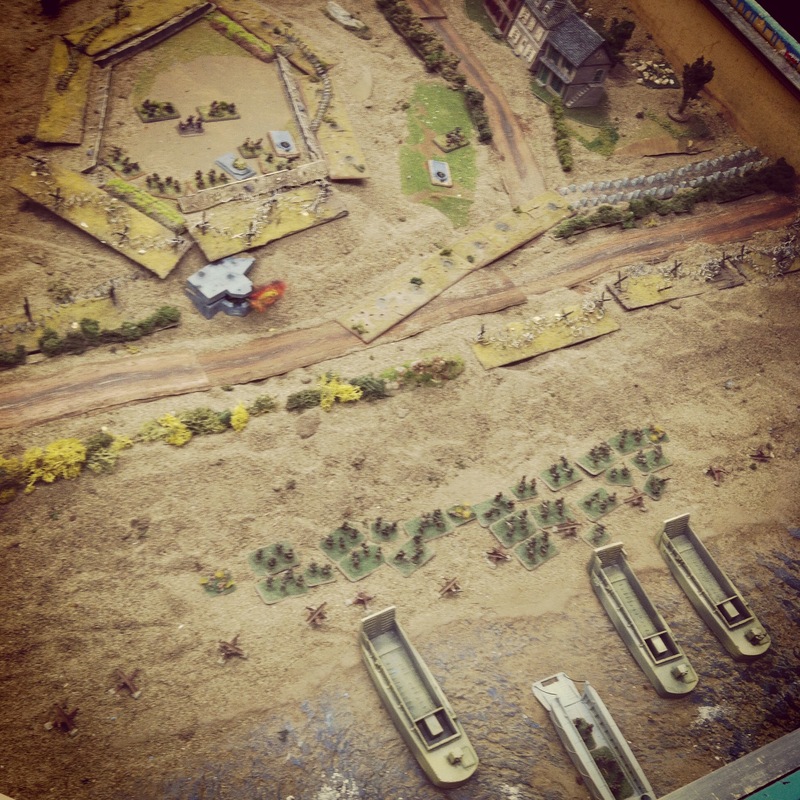 After an initial US naval bombardment which destroyed one stand of German infantry, my boats and DD tanks headed for the beach. 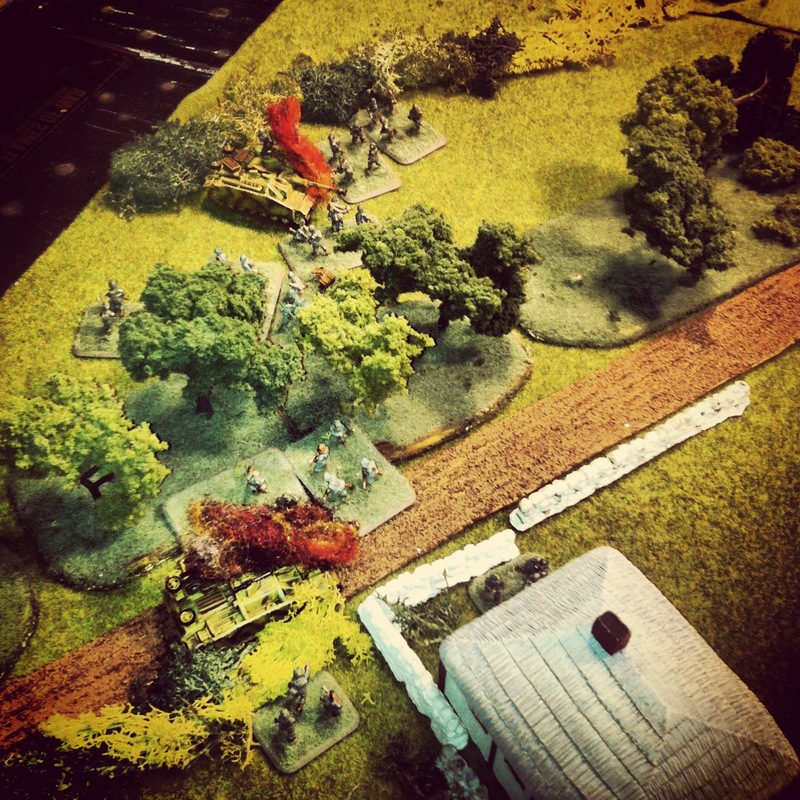 In the initial wave, one DD tank sank in the water offshore and one boat was delayed in the bouncing surf. 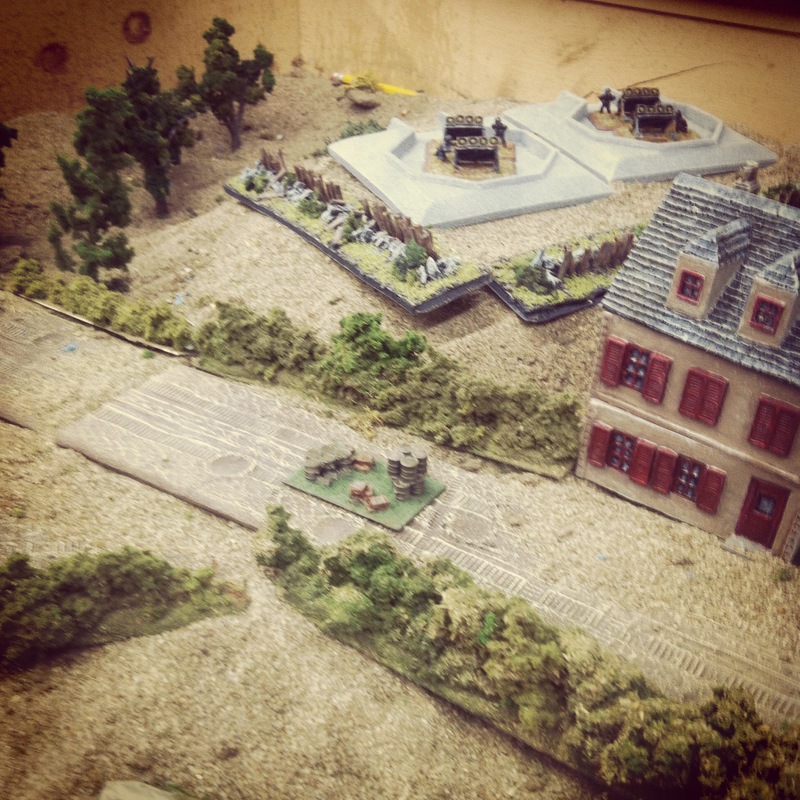 With two platoons of US infantry on French ground, they made way for the barb-wired seawall. 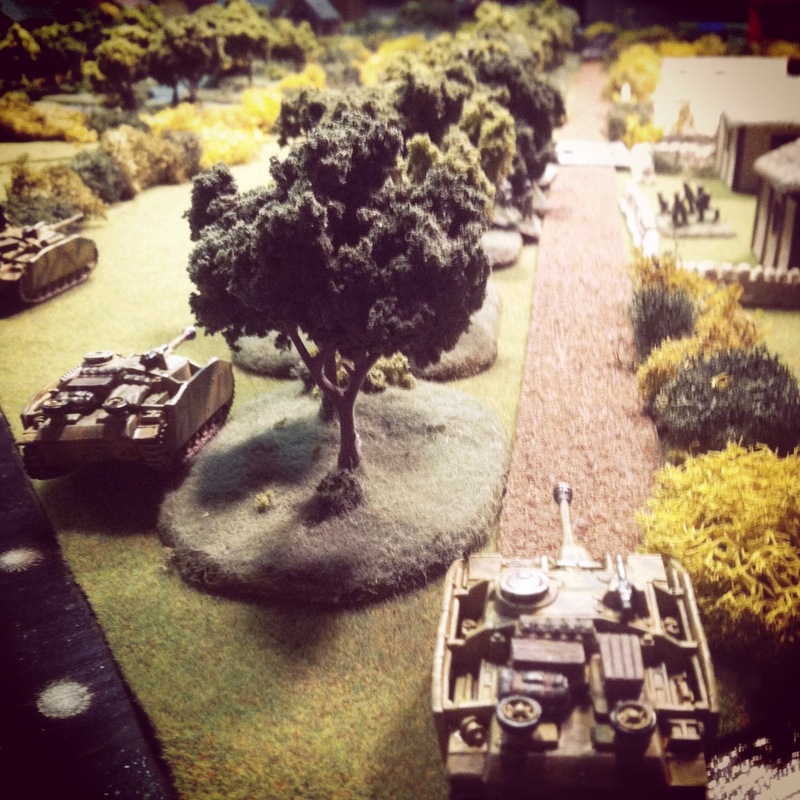 Further down the beach to the right, my three surviving Shermans rolled to the one exit causeway from the beach. 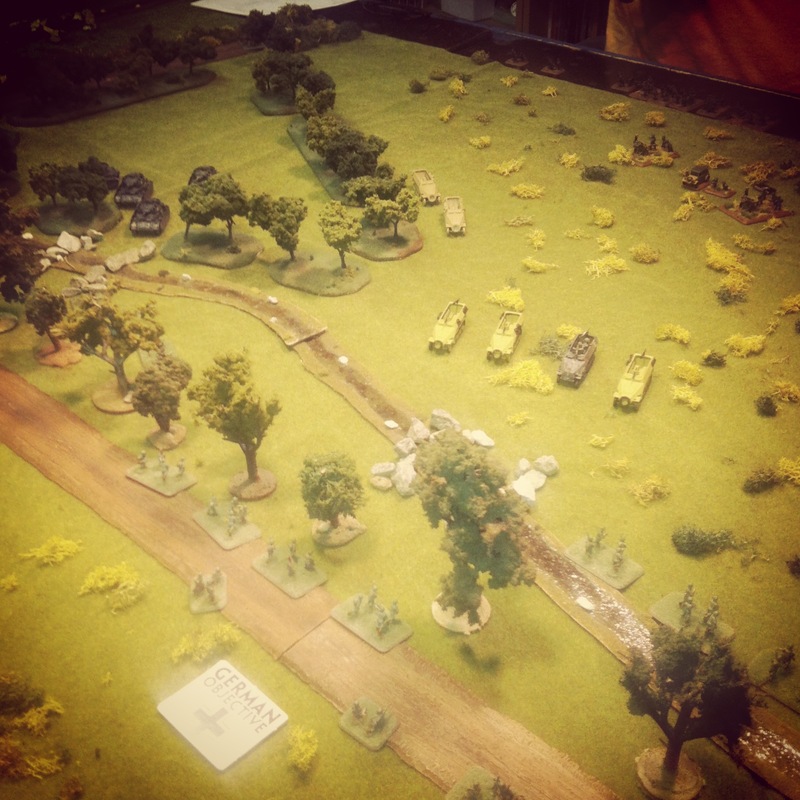 In the opening salvo from the Germans, rocket fire came in from the rear of the table as entrenched guns fired from the beach defensive lines. 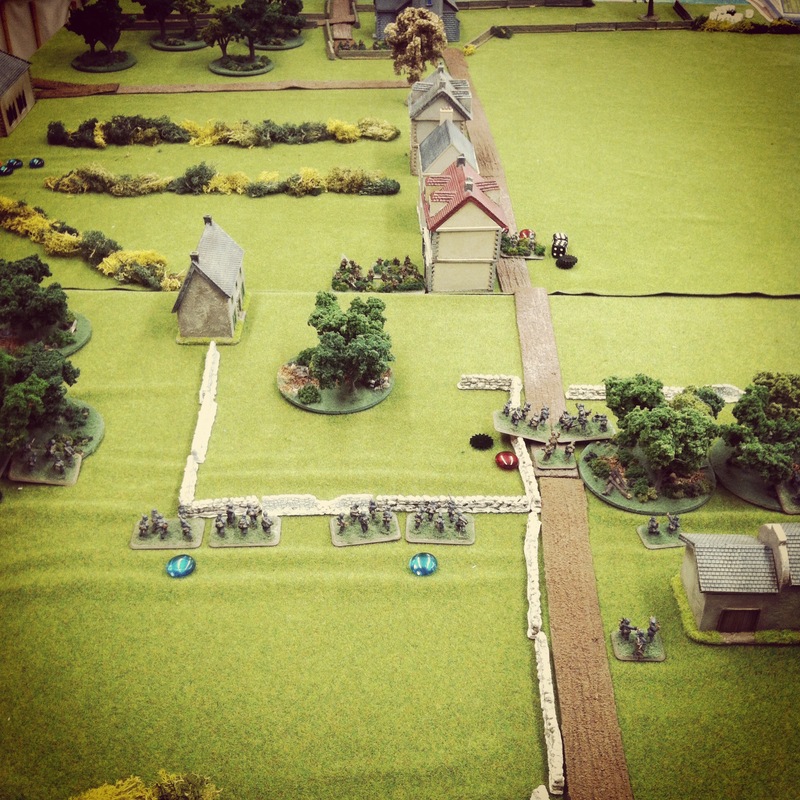 US troops did well with dice roll saves and lost just a few teams before ending the turn pinned high on the beach. 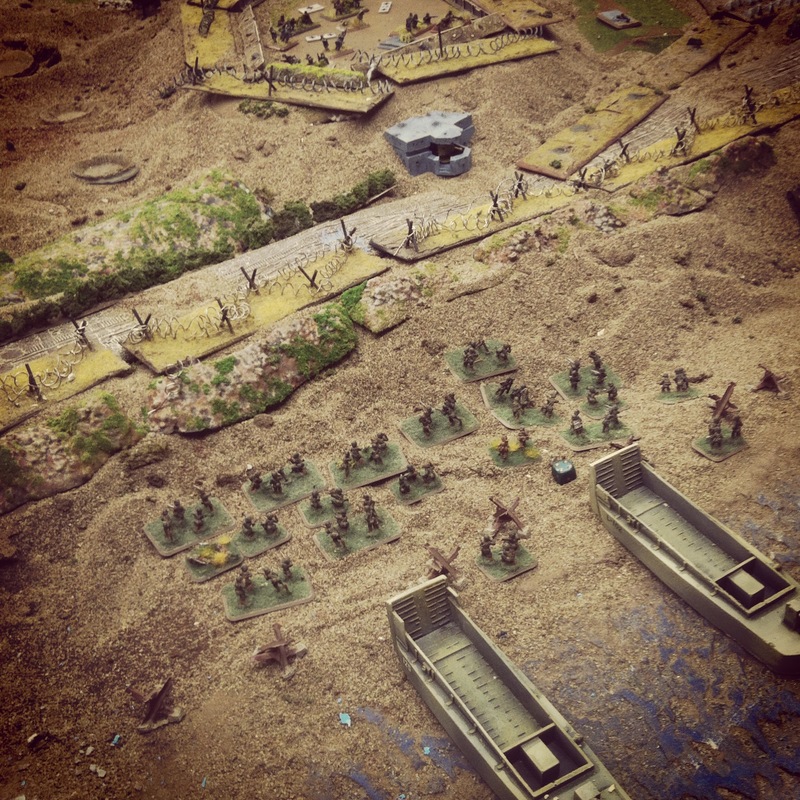 In the next couple turns, landing craft continued to meet mixed success in landing and stalling on the sea. 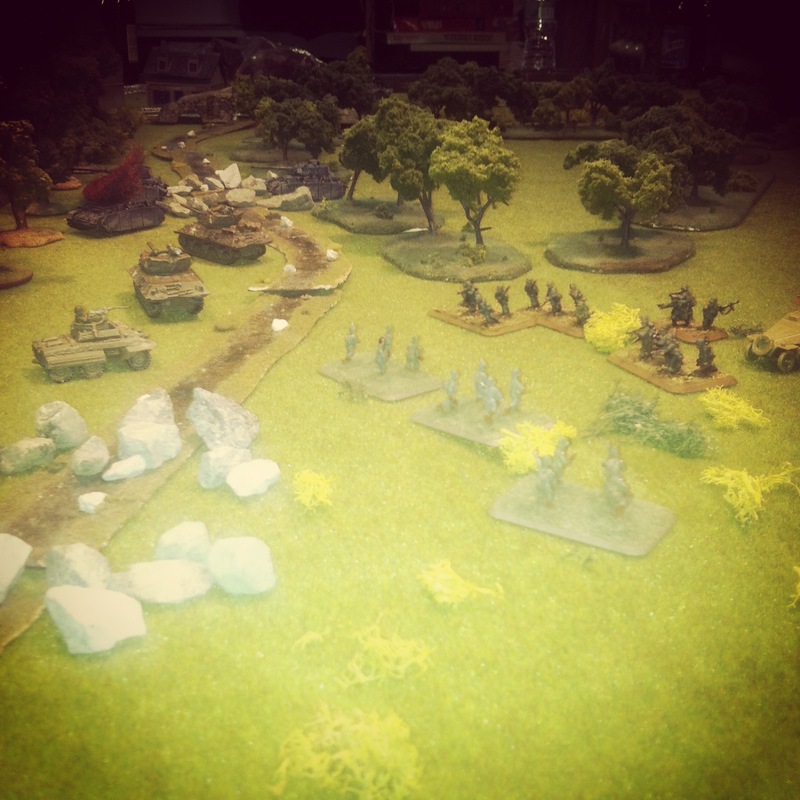 Luckily, most boats didn’t drift too far down the beach, allowing me to execute my general plan of running infantry to the left while my tanks dealt with the heavier nests and pillbox to the center and right. 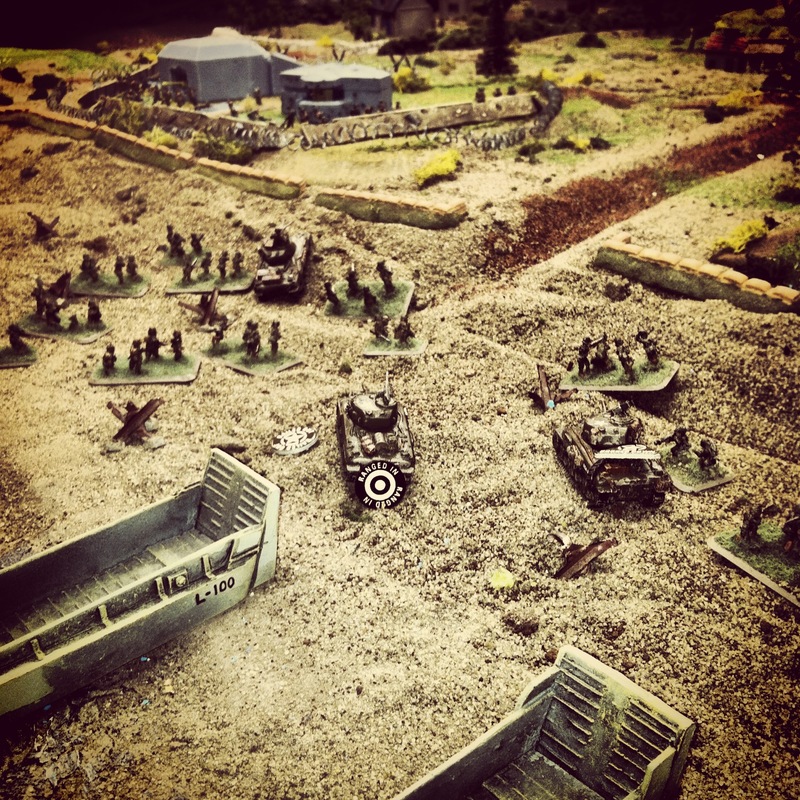 One tank bogged in the sand but the other two rolled over the barbed wire to take up position at the line of minefields, sending fire into the Tobruk nests and gun bunker. 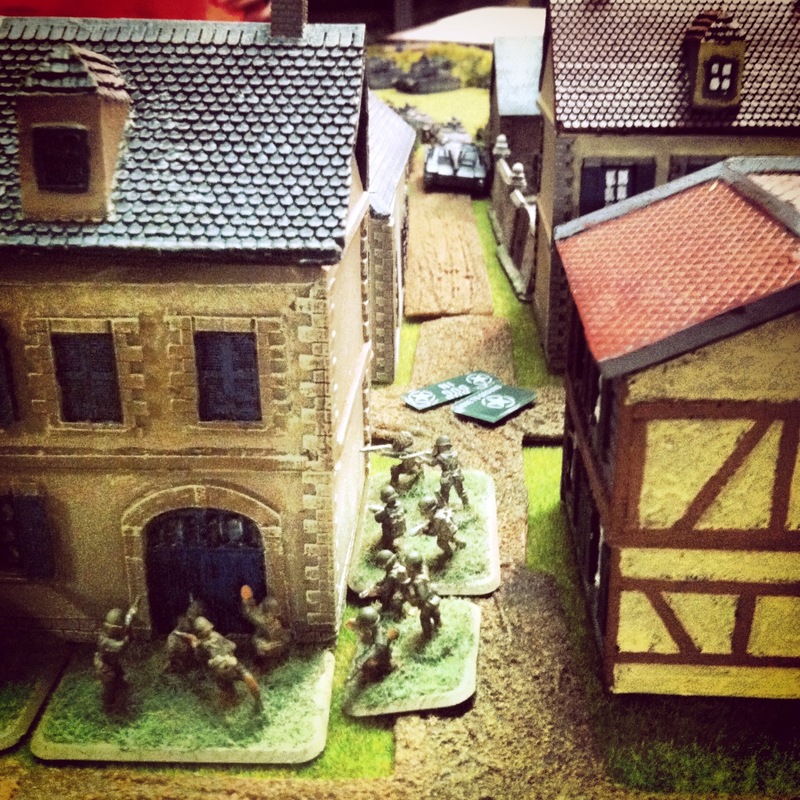 A couple turns in, the bunker was in flames and the German machine guns had been dealt with. 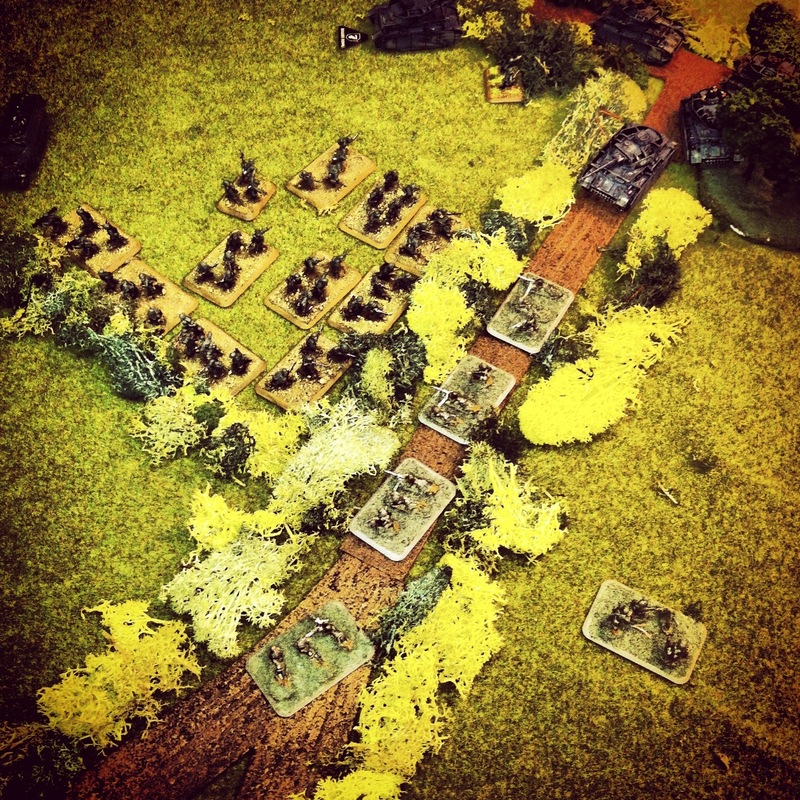 The way was clearing for the US infantry to push inward. 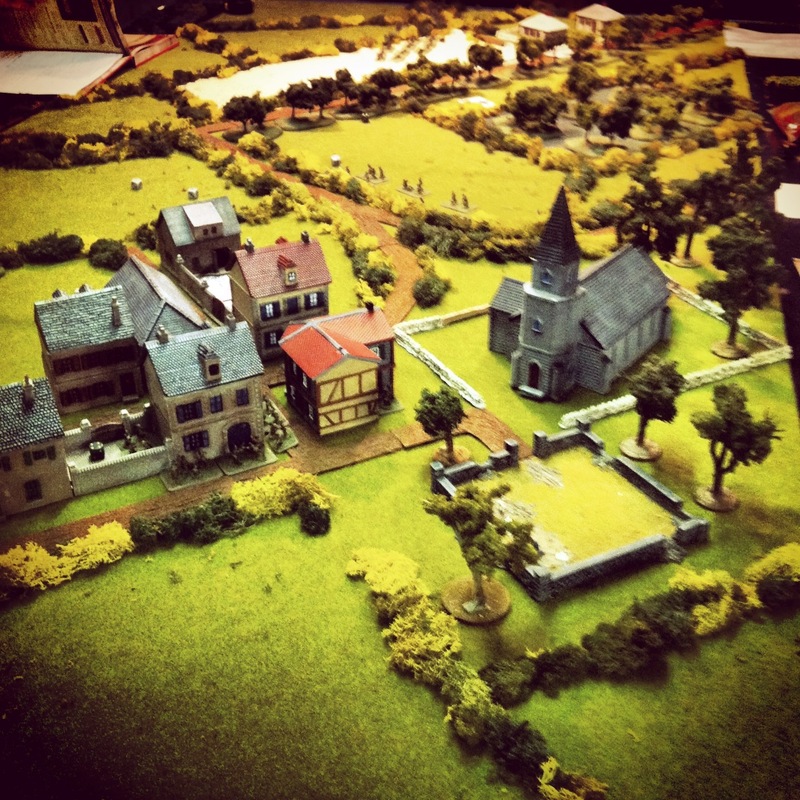 With several US platoons whittled-down in their struggle through several tiers of barbwire, one platoon of German infantry arrived and made way for the row houses near the objective and remaining rockets on the hill. 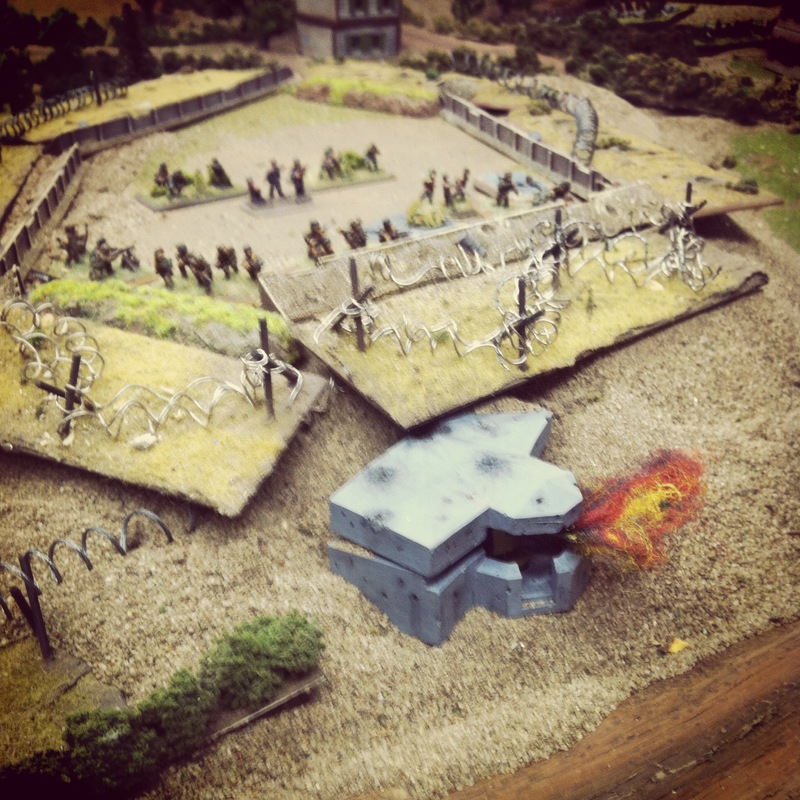 In the open, the Germans took fire from naval guns but most survived to find shelter in the buildings. 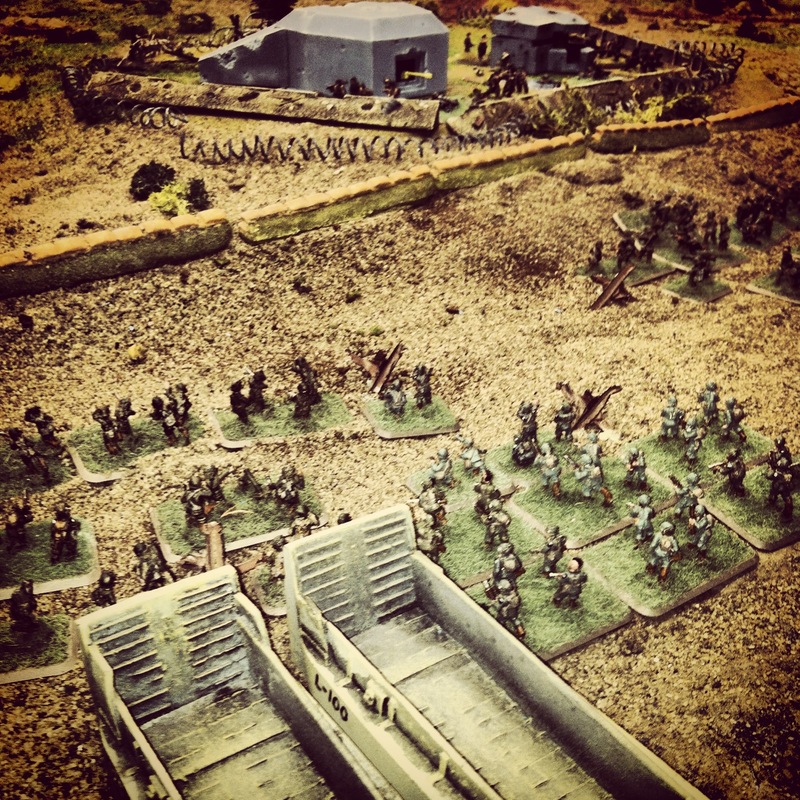 Back on the beach, my final US reserves of M7 Priests landed at the center of the beach and one heavy machine gun section tramped forward at the extreme left. 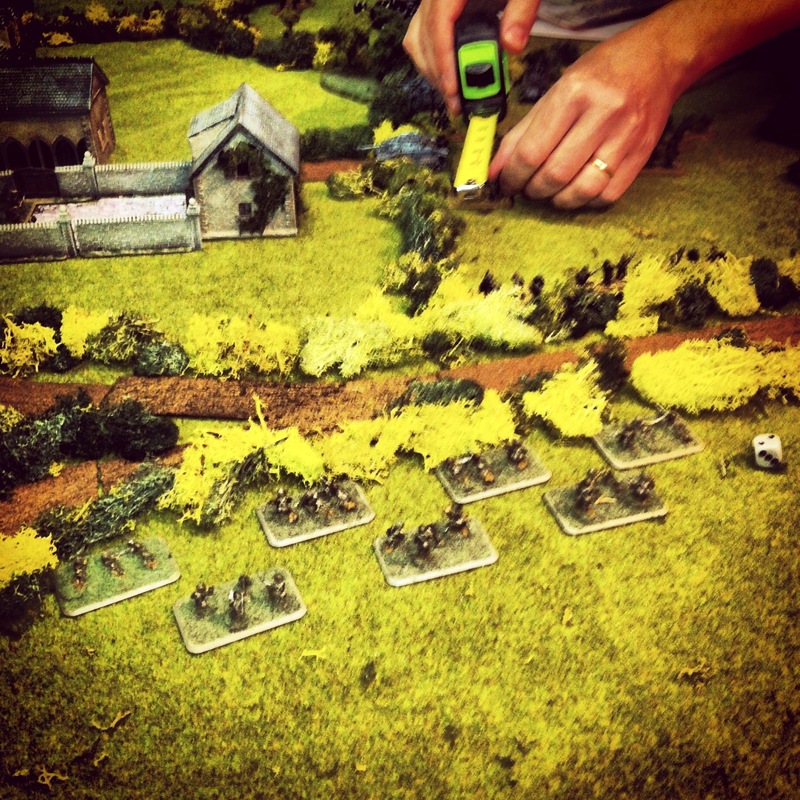 With these late arrivals so far back from the main action, it was up to the forces already inland to get the job done. 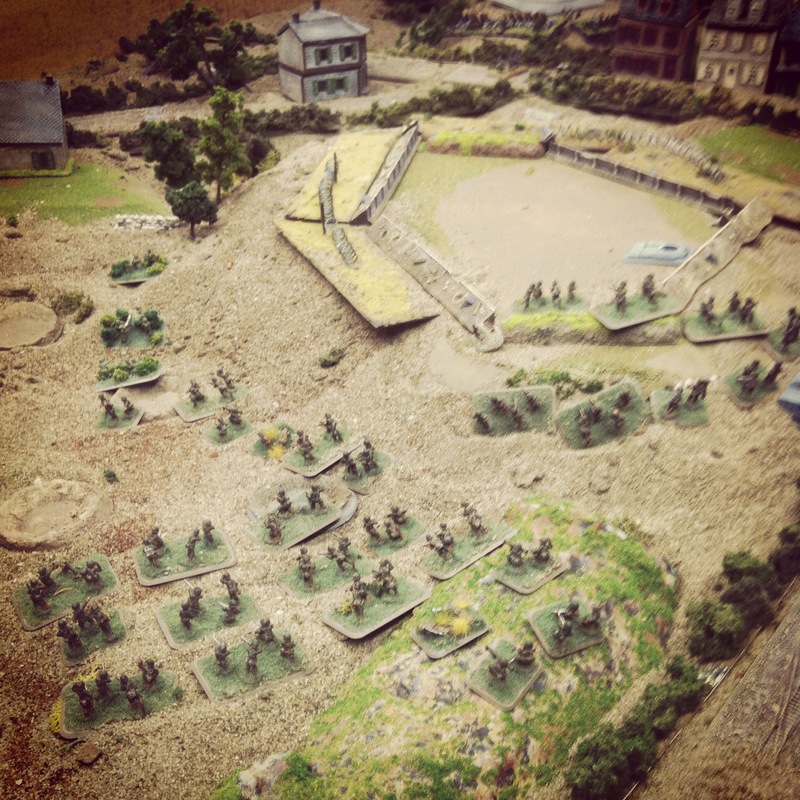 With the major defenses eliminated at the beach, the Shermans turned their machine guns on the remaining German infantry manning the trench line high on the central hill. 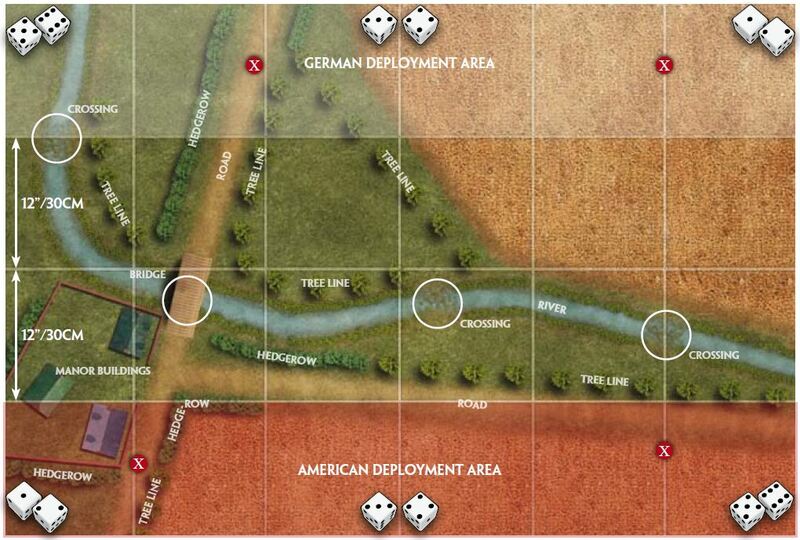 At the same time, US infantry began pushing into the German position after spending turns alternately being pinned by rocket and mortar fire, removing barbwire and shooting back with light machine gun, rifle and direct mortar fire. 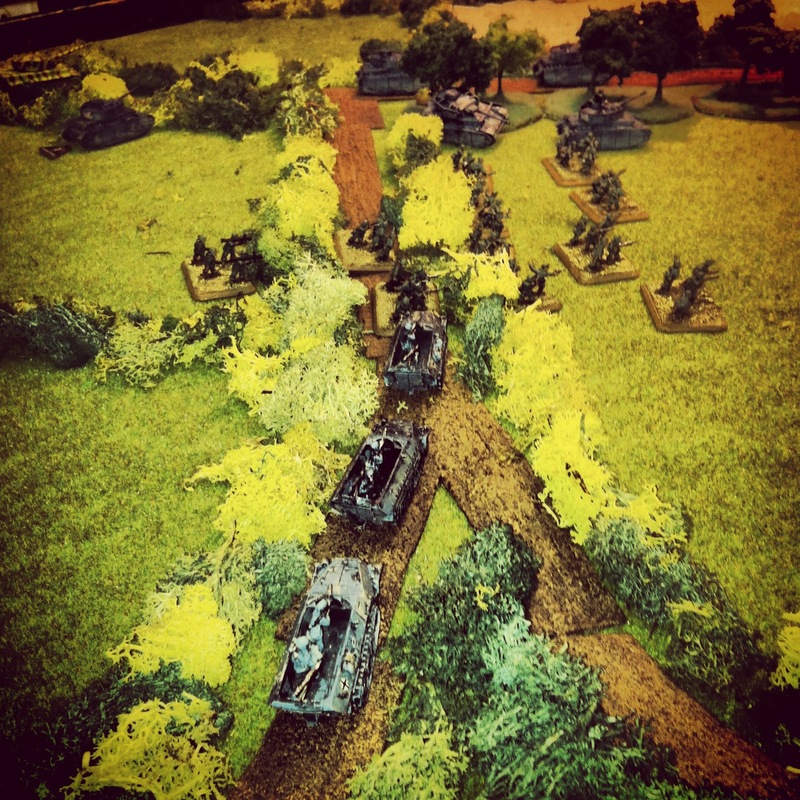 Despite their losses, the combined arms of my US troops really shined, as was often the fateful experience of their German opponents 70 years ago. 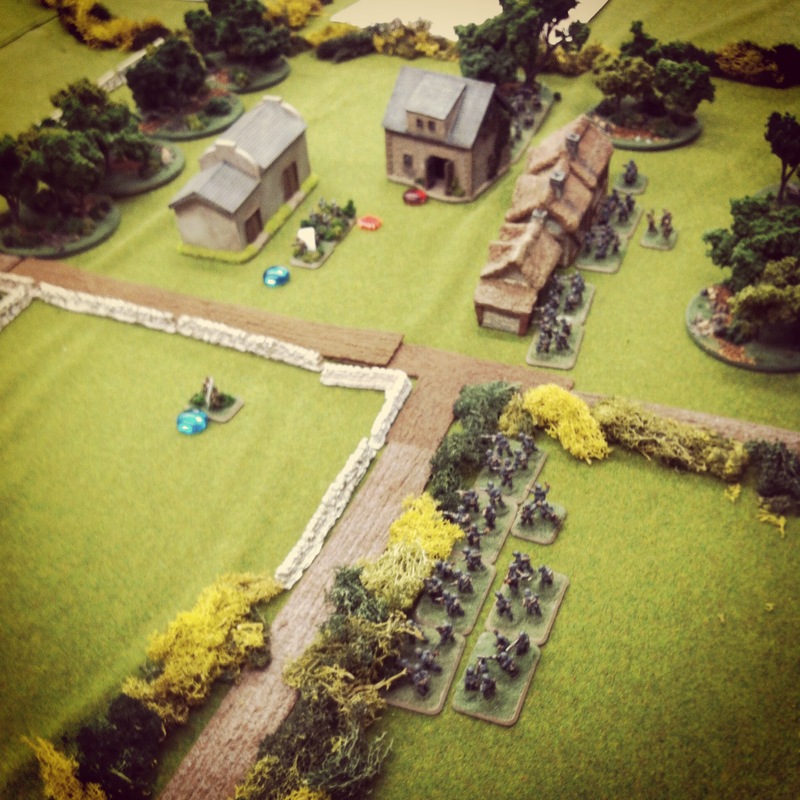 As the game moved into the second-to-last turn, the Americans were ultimately just too far away and too weakened to make the final push to the objective still held by the remaining German infantry comfortably defending from the nearby houses. It had been a pretty even match, but timing was everything. 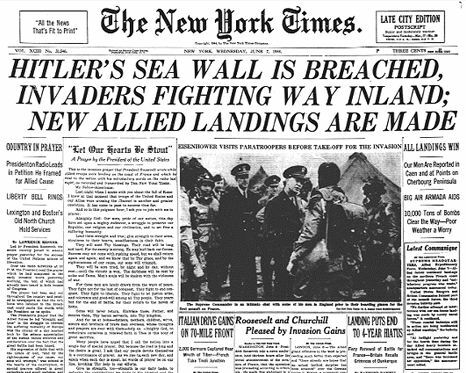 Luckily for the Allies on June 6th, 1944, the only limits on the day’s outcome at “Bloody Omaha” was the grit and dedication of the storm of humanity hitting the beach. 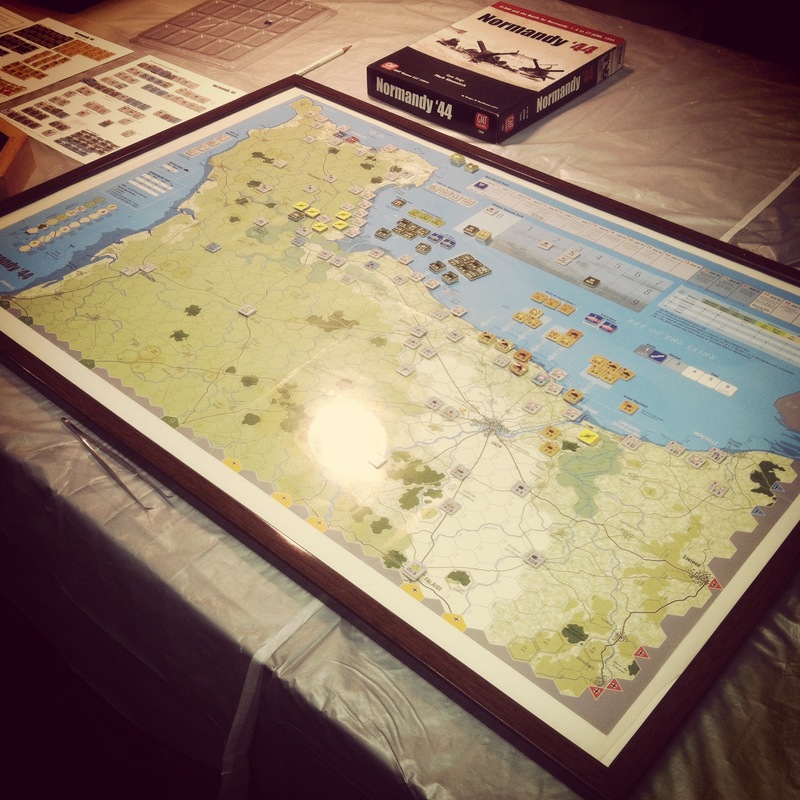 In the late evening of June 5th and pre-dawn hours of June 6th, 1944, a steady flow of Allied paratroopers began dropping throughout the French countryside to clear the inland way for the D-Day beach landings to come later that morning. 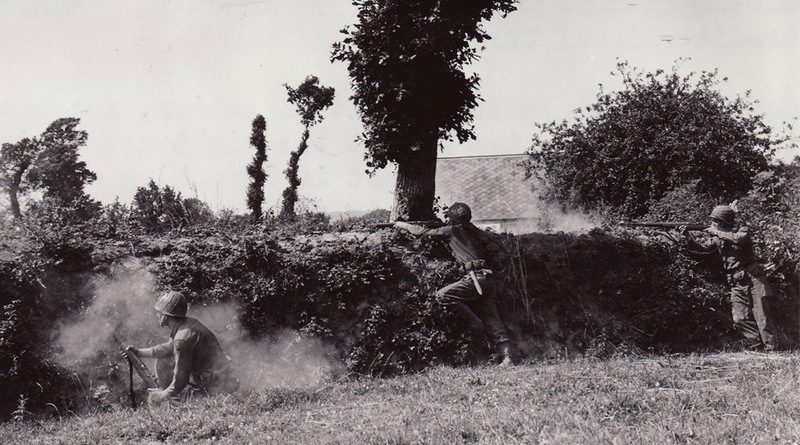 Like elsewhere, scheduled US Airborne drops near Sainte-Mère-Église left paratroopers scattered around the countryside. 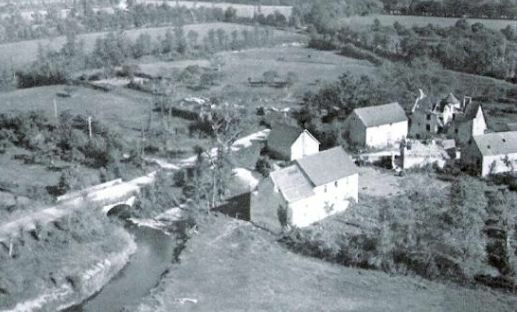 To the southwest of the town’s target area, a contingent from the 82nd Airborne found itself near a quaint French farm compound and a small bridge over the Merderet River. 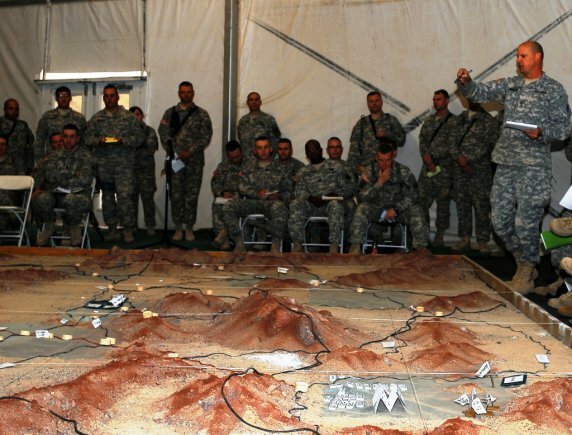 Recognizing the river crossing as a key defensive line, the assembled paratroopers established a perimeter along the river. 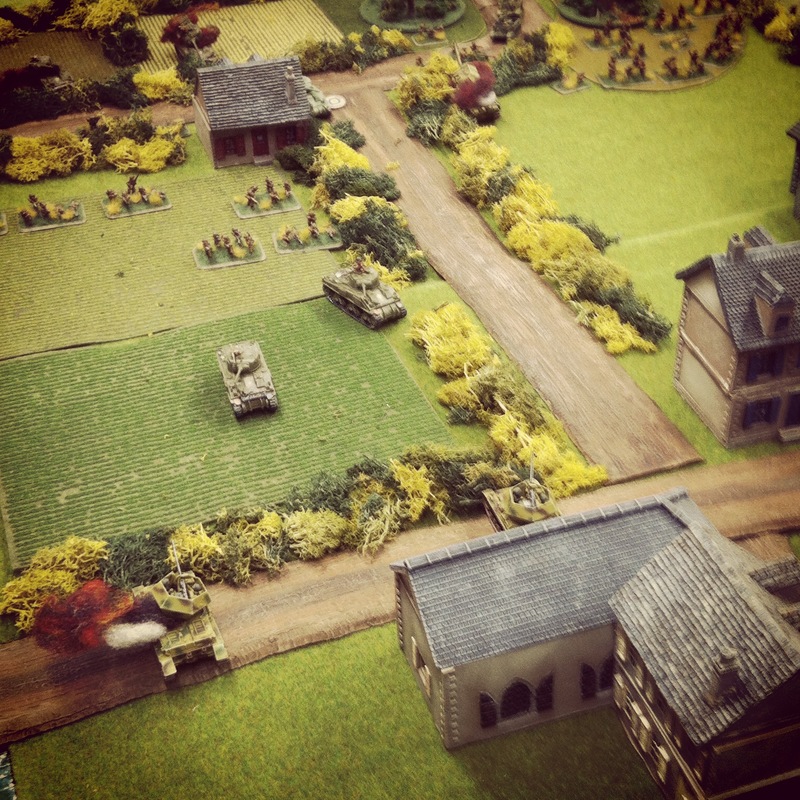 A few hours later, the US troops were met by a German Grenadier and armored battallion hoping to stall the Allied invaders from moving inland. 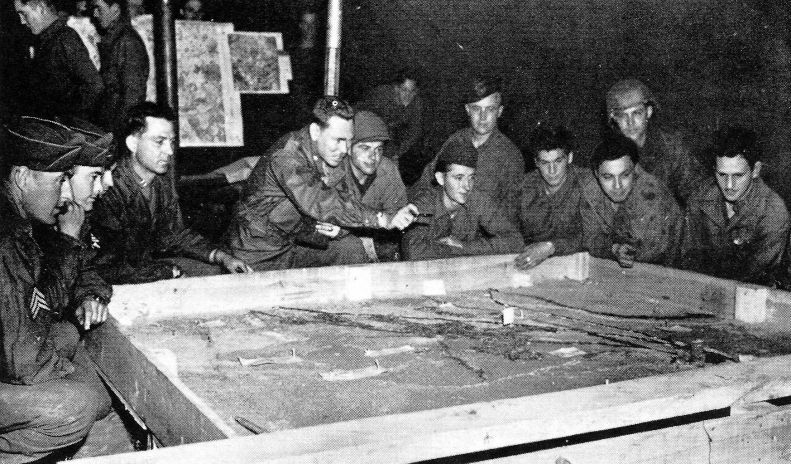 The battle that erupted at the river would rage for three days until the German force withdrew in time for the arrival of US infantry and Sherman forces rolling in from Utah Beach on June 9th. 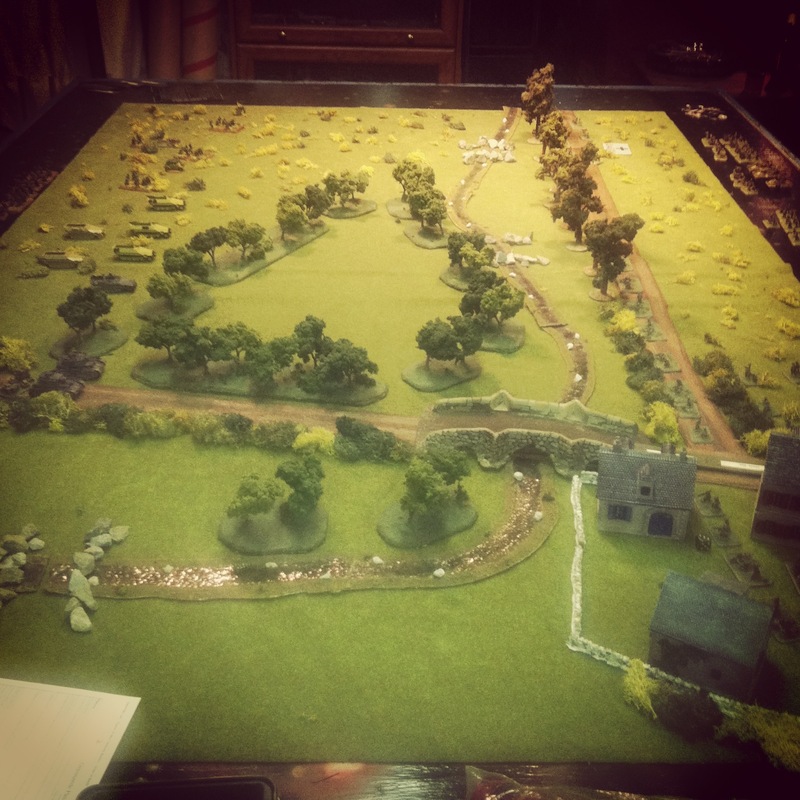 The Flames of War website offers a basic scenario of the encounter at La Fiere Causeway suitable for 1500 point forces on either side. 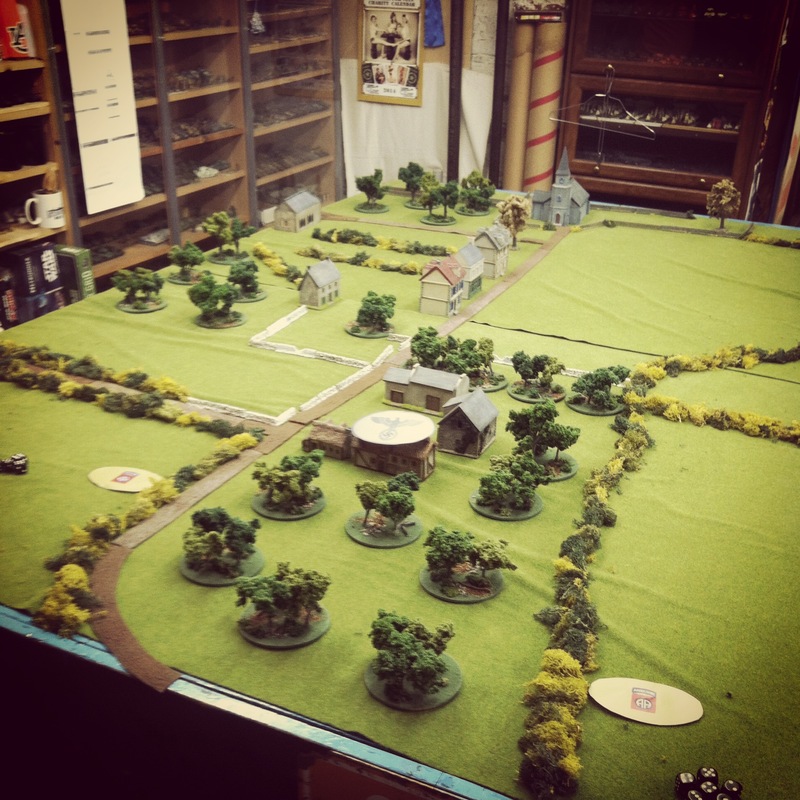 This past weekend a visitor to Metropolitan Wargamers and I had a go at the scenario with my US Airborne facing off against his Germans. 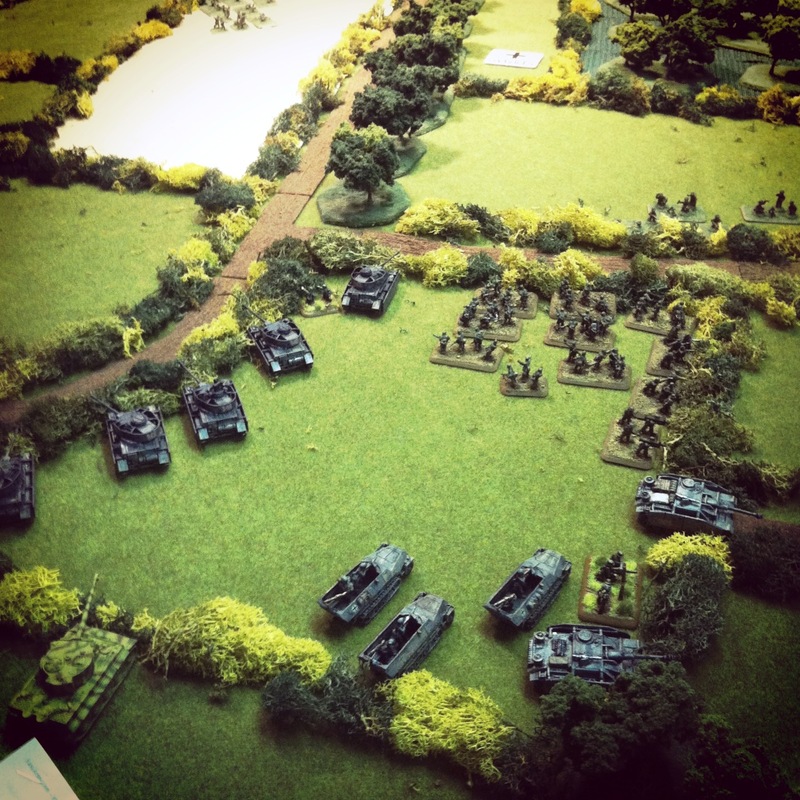 As with the historical record, my force held closely to the scenario’s outline with two parachute rifle platoons with plenty of bazookas supported by a platoon of light machine guns, parachute engineers, a glider artillery platoon and M18 tank destroyers. 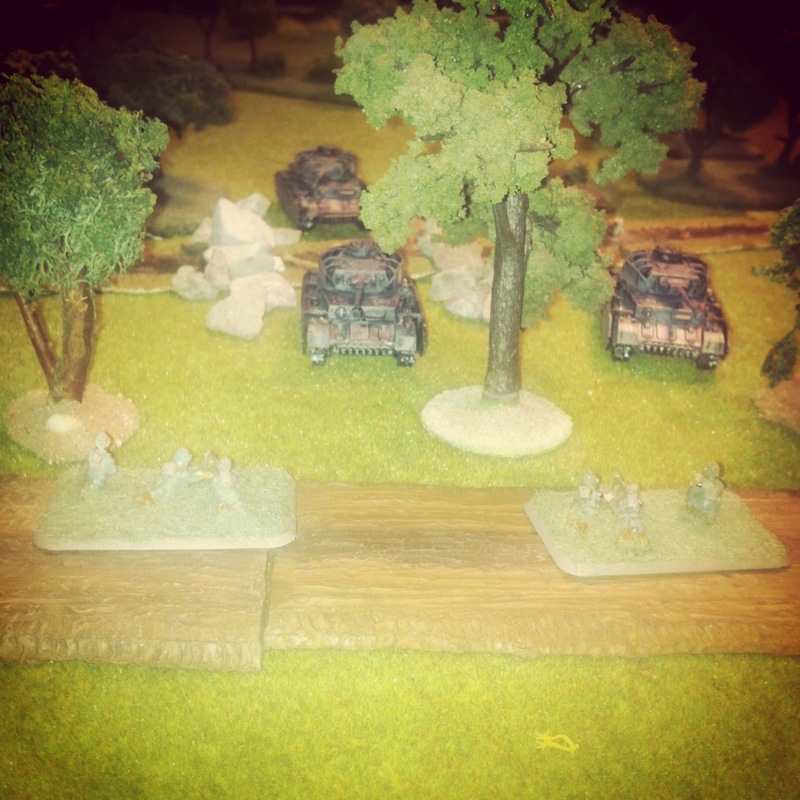 On the German side of the table, my opponent lacked the primitive French tanks that historically fought at the battle. 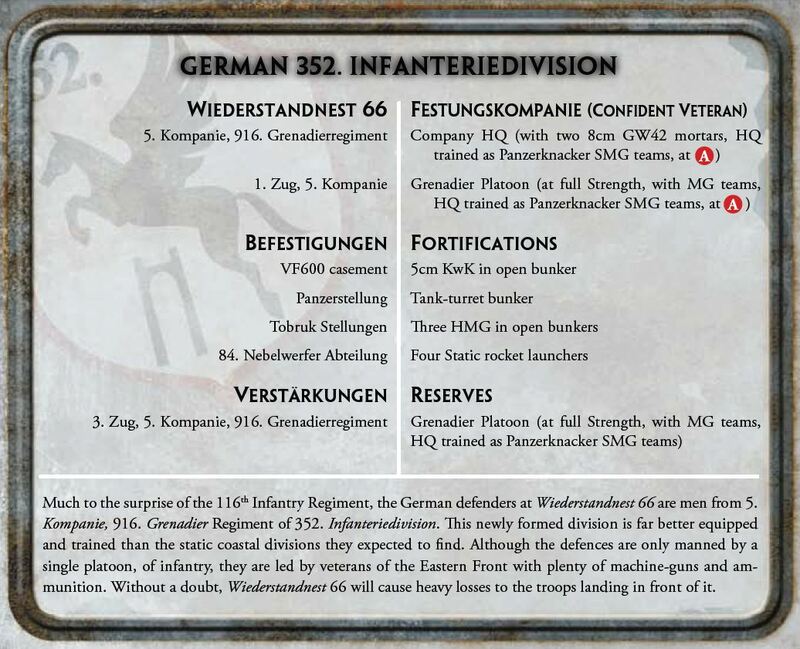 Instead, he filled his force with a number of Grenadier platoons mounted in half tracks backed by two small platoons of Panzer IVs and a Nebelwerfer rocket battery. 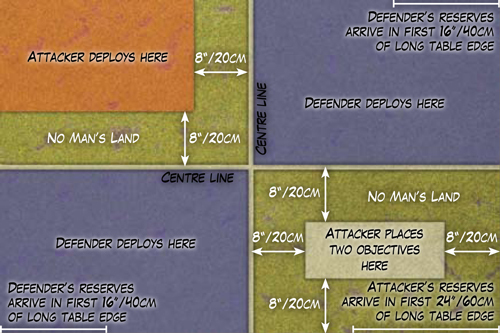 As per the scenario rules, each of us chose half of our platoons to be held in off-table reserve. 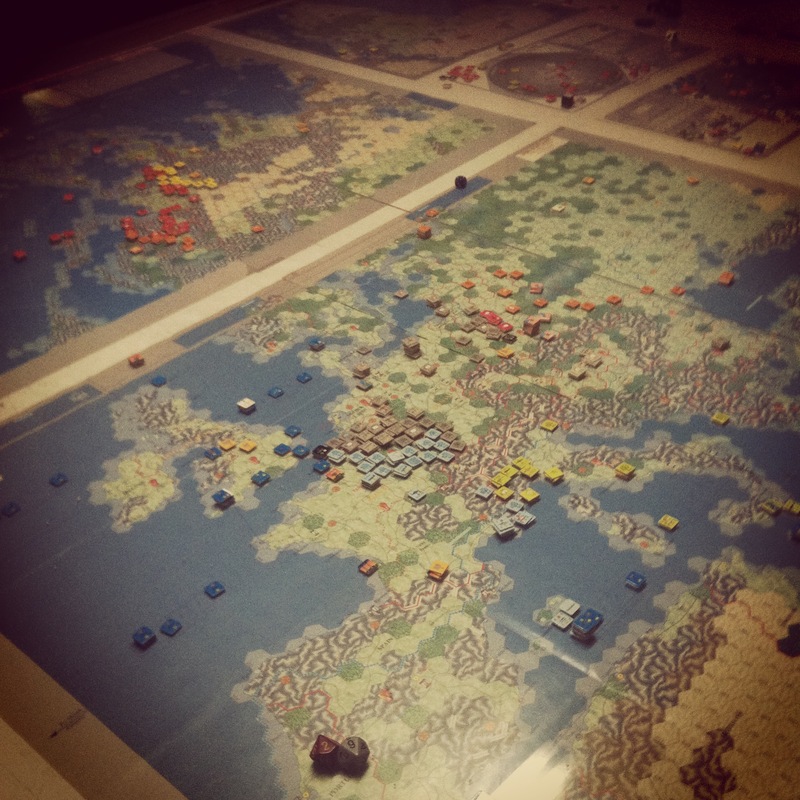 Beginning with the Germans, we alternated deploying our starting forces on the table. 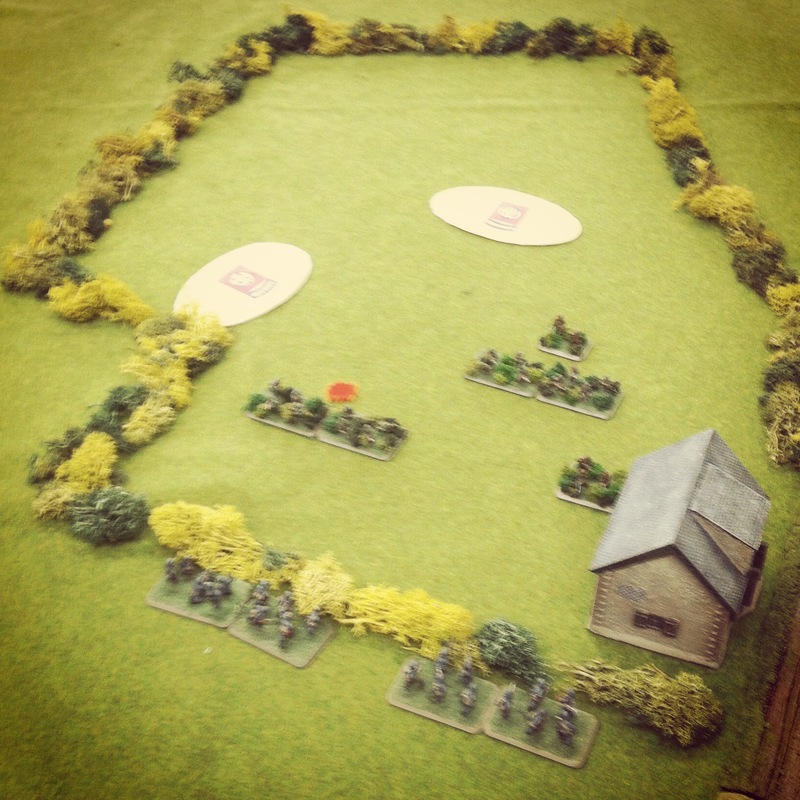 My American engineers took up position in the courtyard of the farm on my left flank, the machine guns lined the hedge on the other side of the bridge and a rifle platoon deployed on my far right flank. 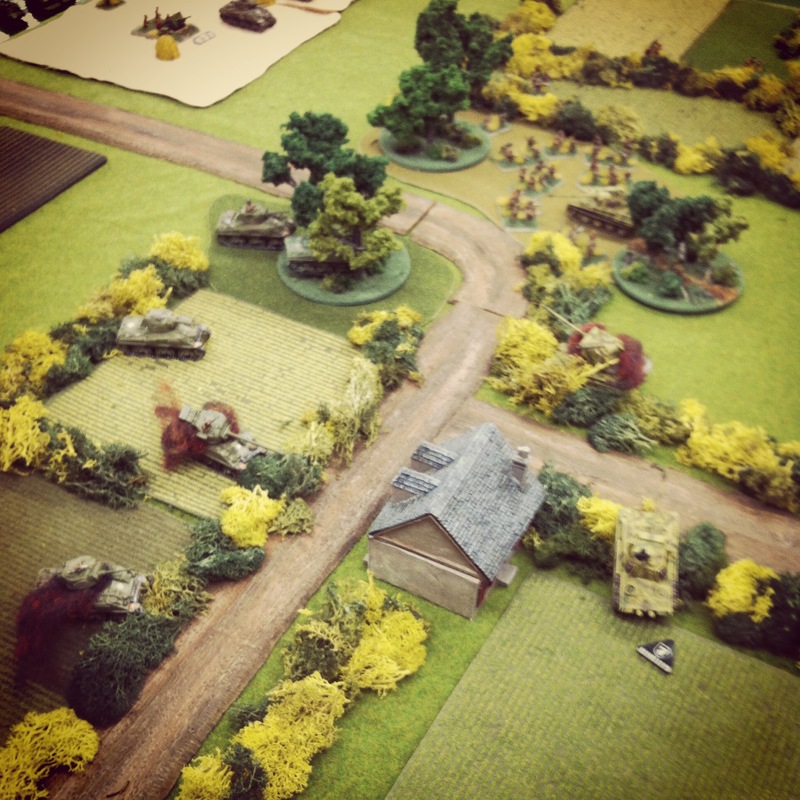 As expected, the Germans deployed a tank platoon at the road entry point and the rocket battery and a mounted Grenadier platoon in the field on their left flank. 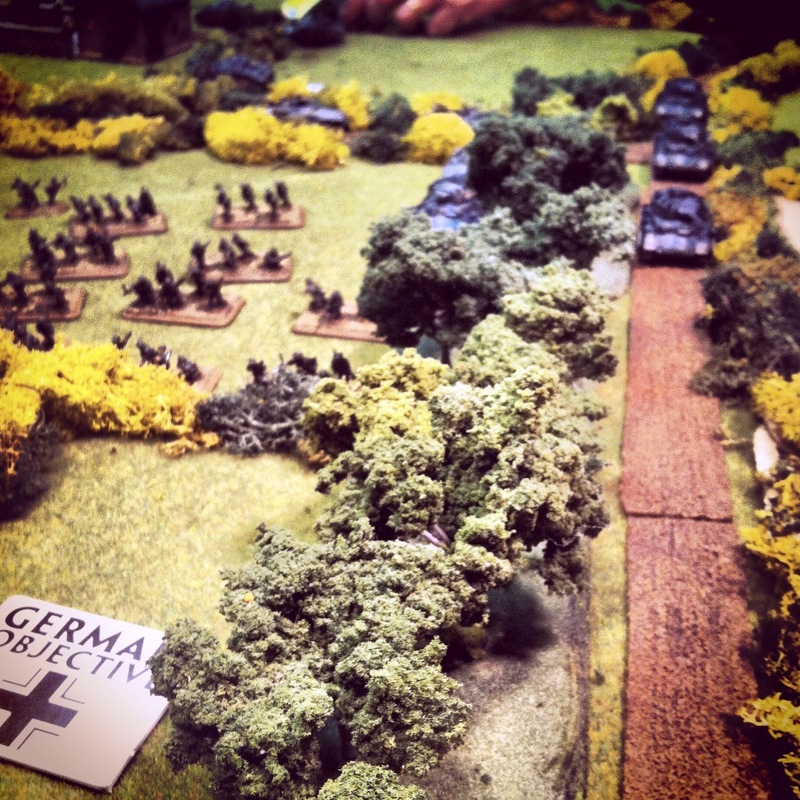 With the Germans taking the first turn, the first Panzer IV platoon made way for the river crossing at the middle of the table while the half tracks rolled for the ford on the American right flank. 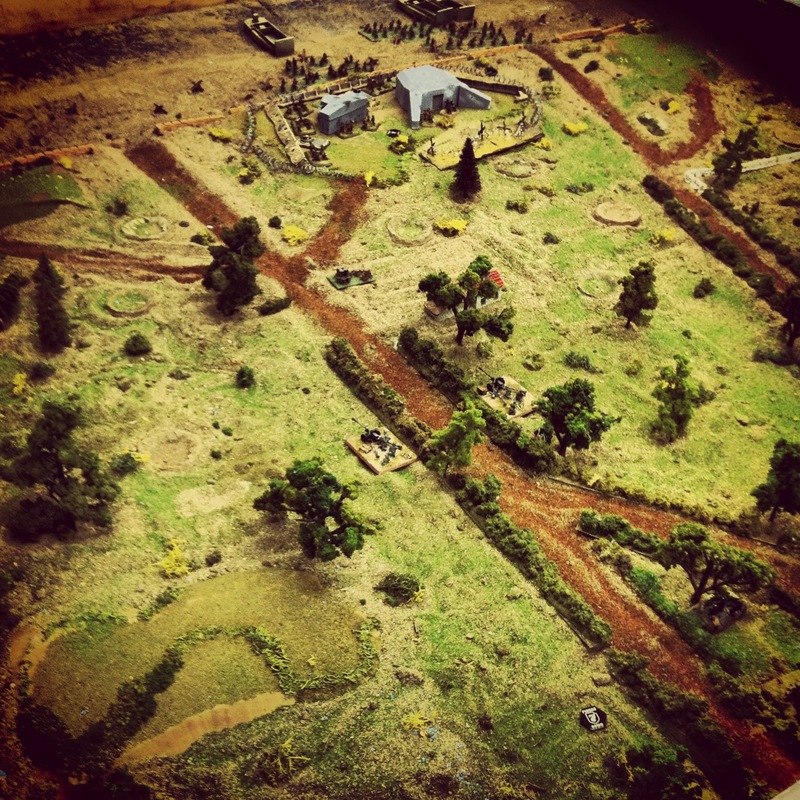 Deployed in and around the farm buildings, the US engineers quickly laid down mines at the foot of the bridge and an Airborne platoon crossed the river to meet the approaching Grenadiers and the rocket battery beyond. 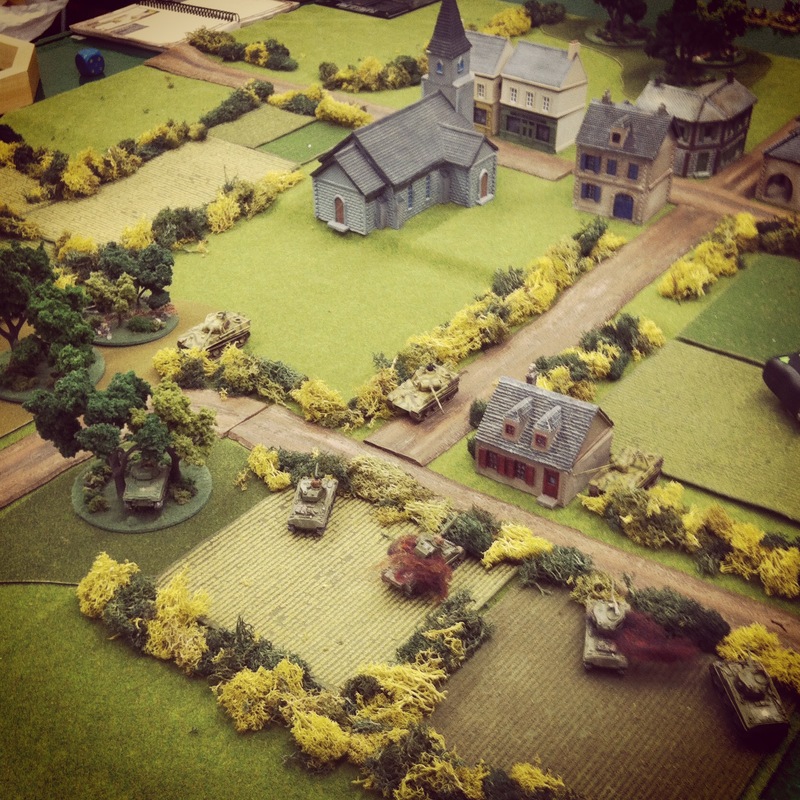 With turn three, German tank and Grenadier reserves appeared on the table edge opposite the farm and pointed their way toward the French buildings and the nearby bridge. 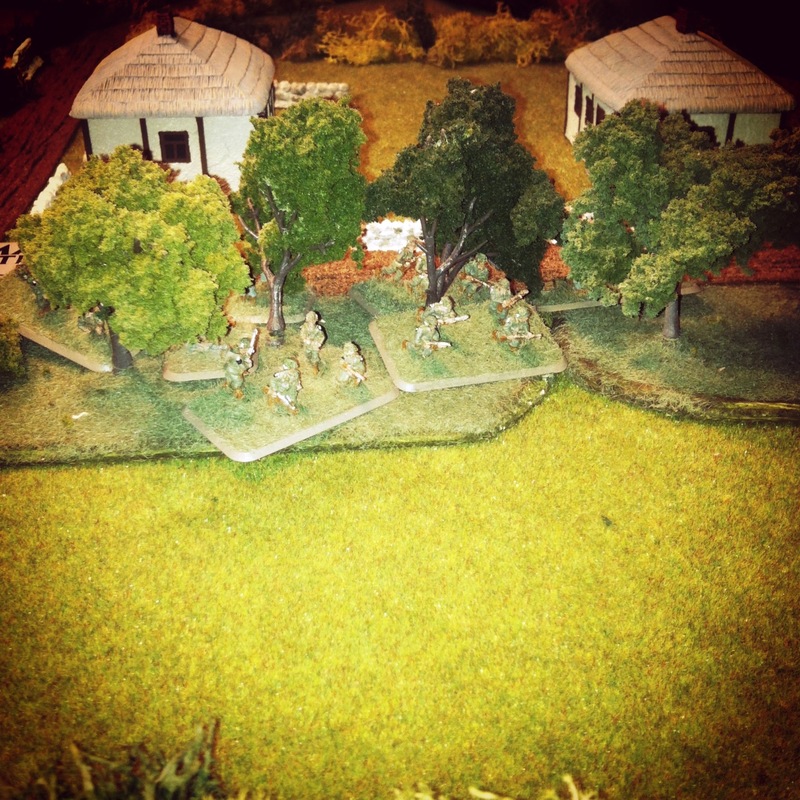 Four US bazookas bailed one Panzer in the clearing across the river but three other Panzers made it across at the middle ford. 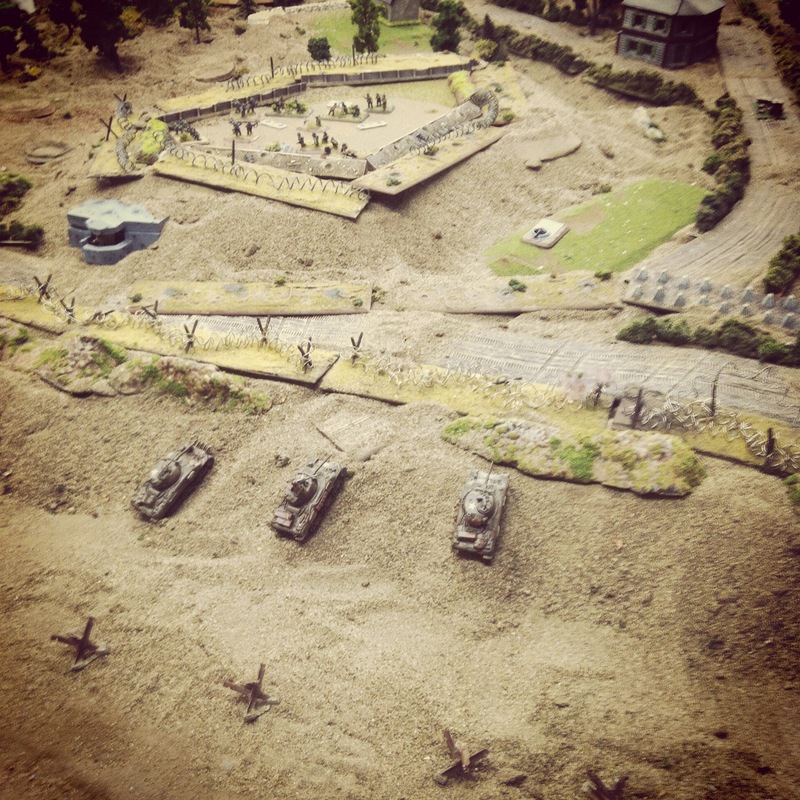 US tank destroyer reserves came on the table and immediately poured machine gun fire into the half tracks across the river. 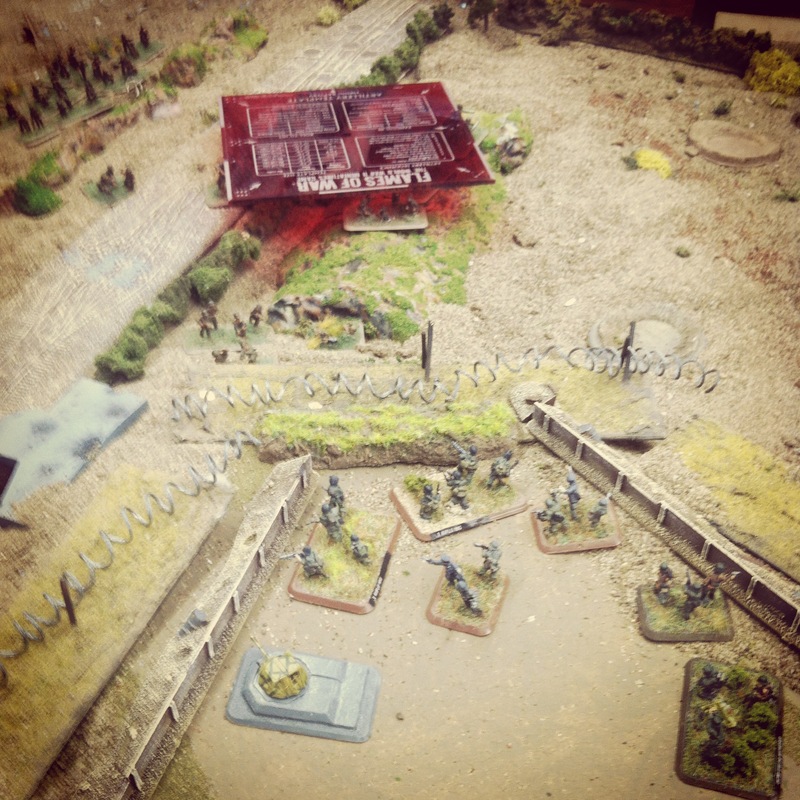 The Grenadiers bailed from their transports and the half tracks raced to the rear while the Nebelwerfers failed to score effective shots in the hearty US Airborne troops. 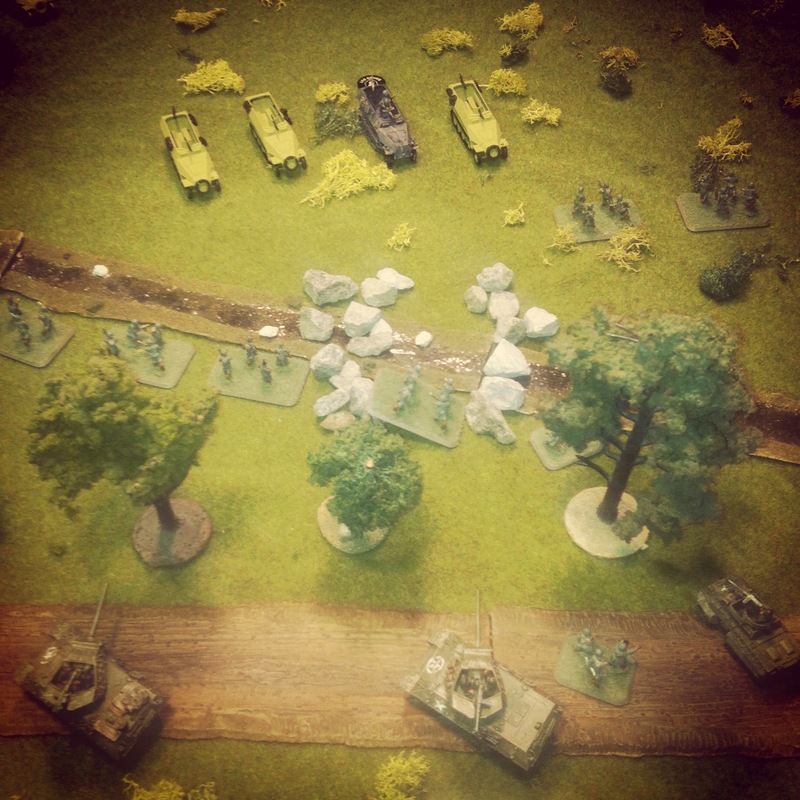 With the Grenadiers on the run back to defend the rocket battery, the US tank destroyers turned their attention on the Panzers and quickly destroyed one while the others continued to push on unharmed due to the protection of their side Schurzen armor. 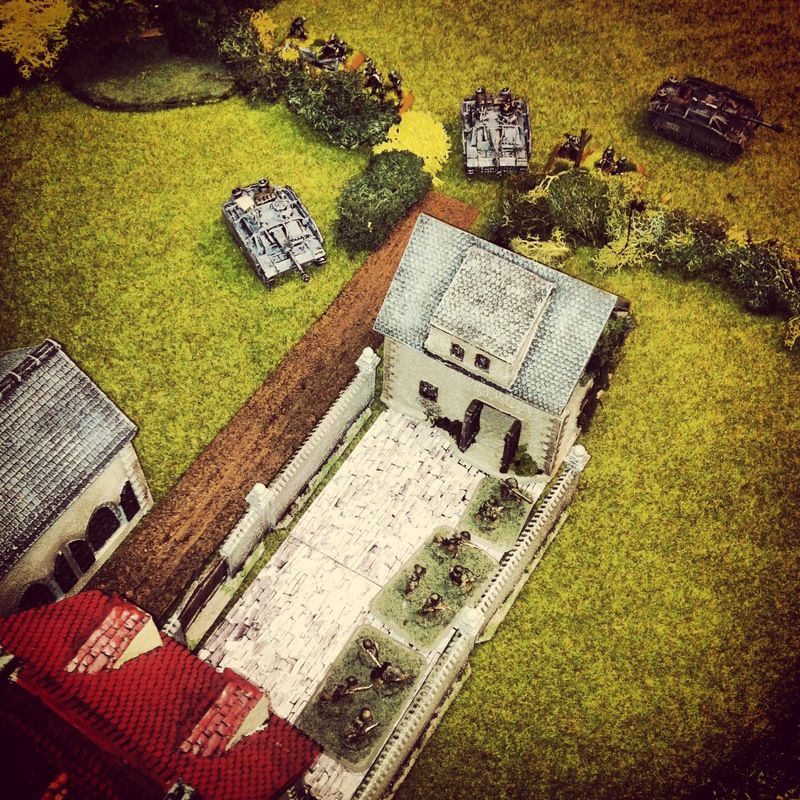 At the farm, the approaching Panzer and Grenadier platoons exchanged fire with the engineers and riflemen defending behind the stone walls. 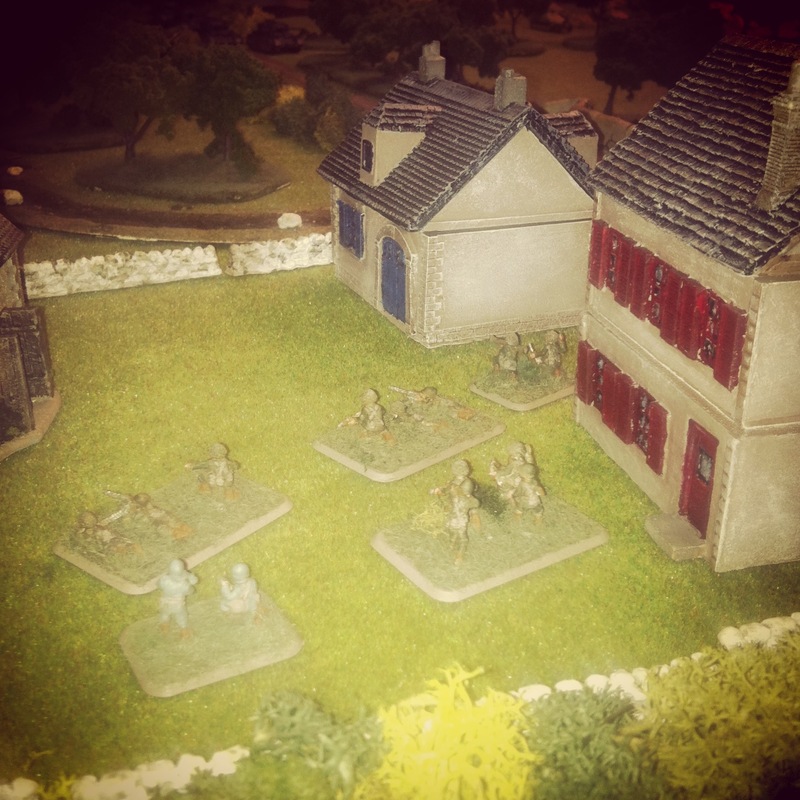 Even with heavy casualties, the engineers repelled a direct assault by two Panzers as a fresh rifle platoon rushed to reinforce the farmyard strongpoint. 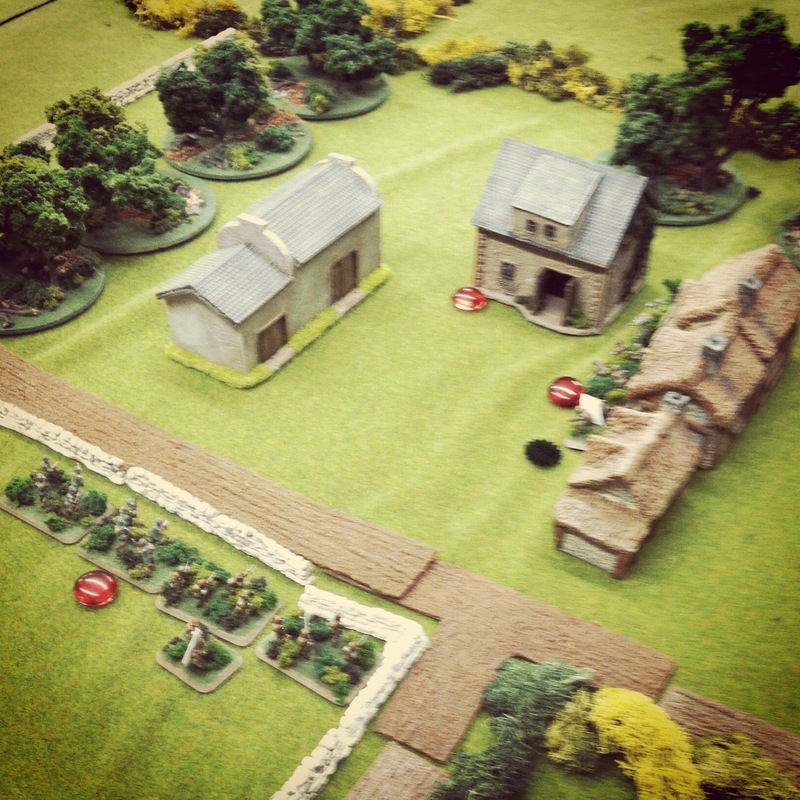 Alas, by the fifth turn the game was effectively over for the Americans as the late-arriving US howitzers once again failed to hit in one final volley against the Panzers rushing to seize the objective. 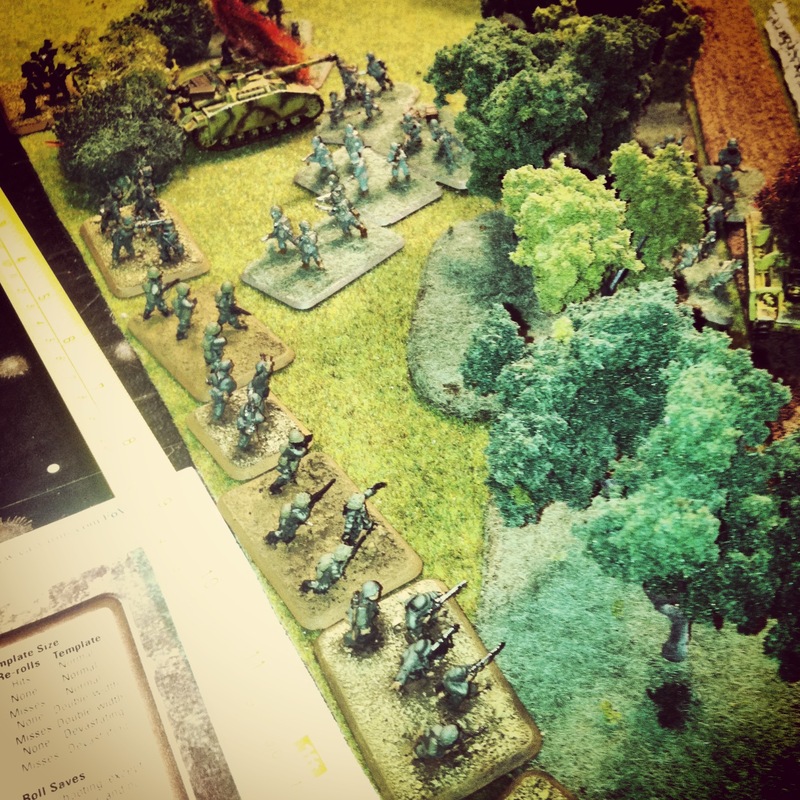 The Americans had chased both Grenadier platoons from the field and destroyed a couple Panzers, but the Airborne focus on defending rather than seizing objectives allowed the Germans to take the table. 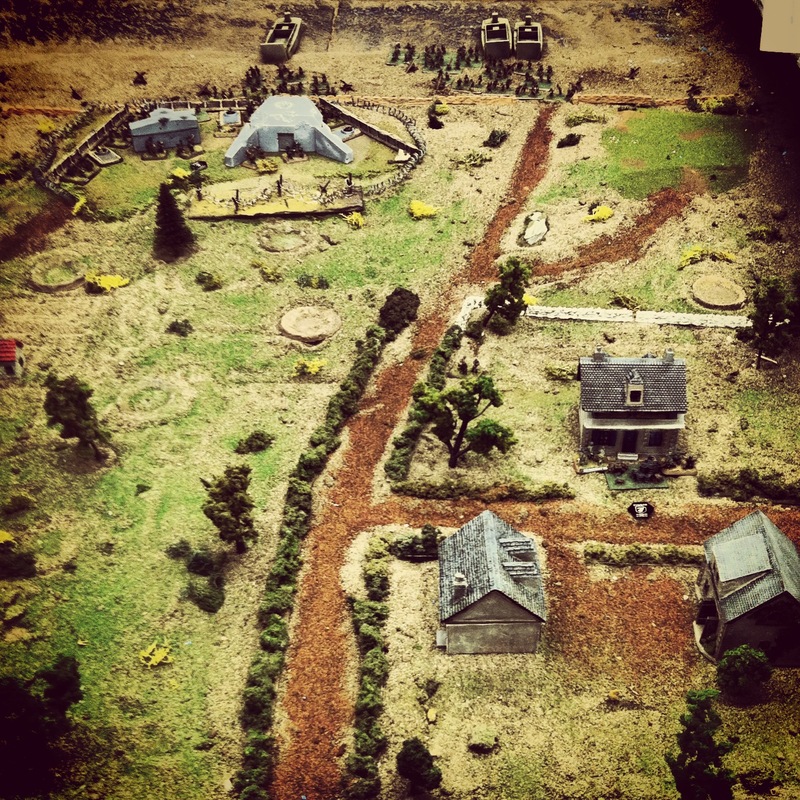 At the game’s outset, both of us shook our heads with the difficult mission ahead of us. 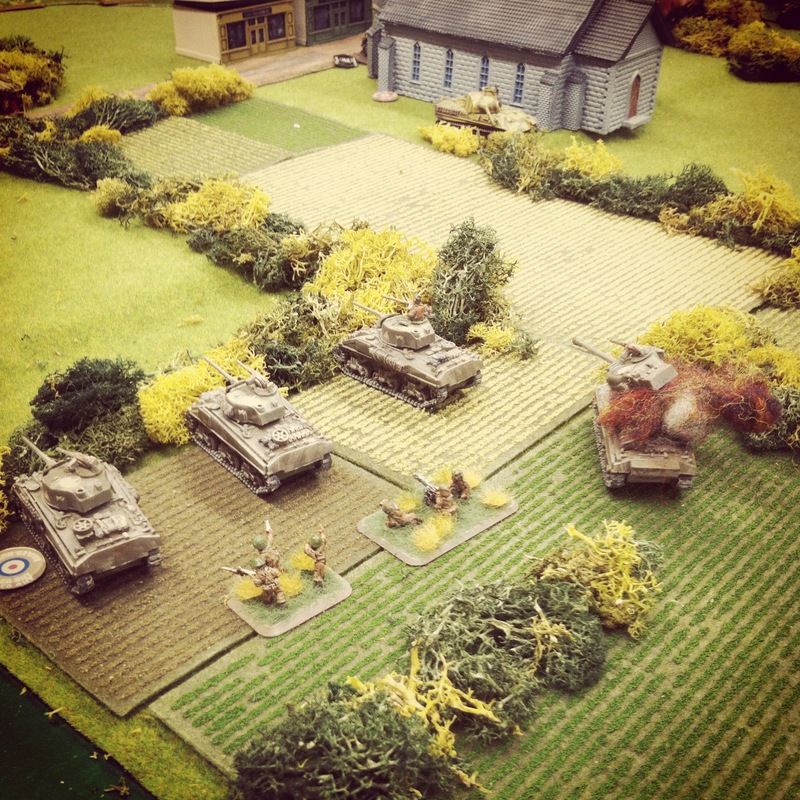 The Airborne never effectively engaged in a close-quarters assault that might’ve taken out more of the tanks sooner on in the game, and artillery on both sides contributed nothing to the game. 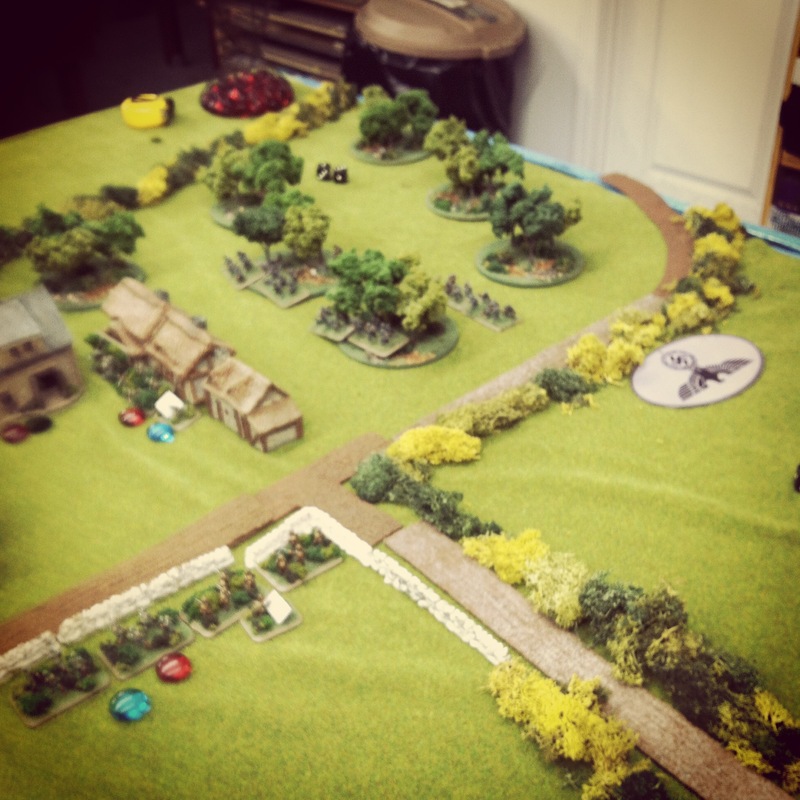 As with the last few FOW games I’ve played, the engagement at La Fiere once again pointed out the strength and tactical importance that infantry played in WWII. 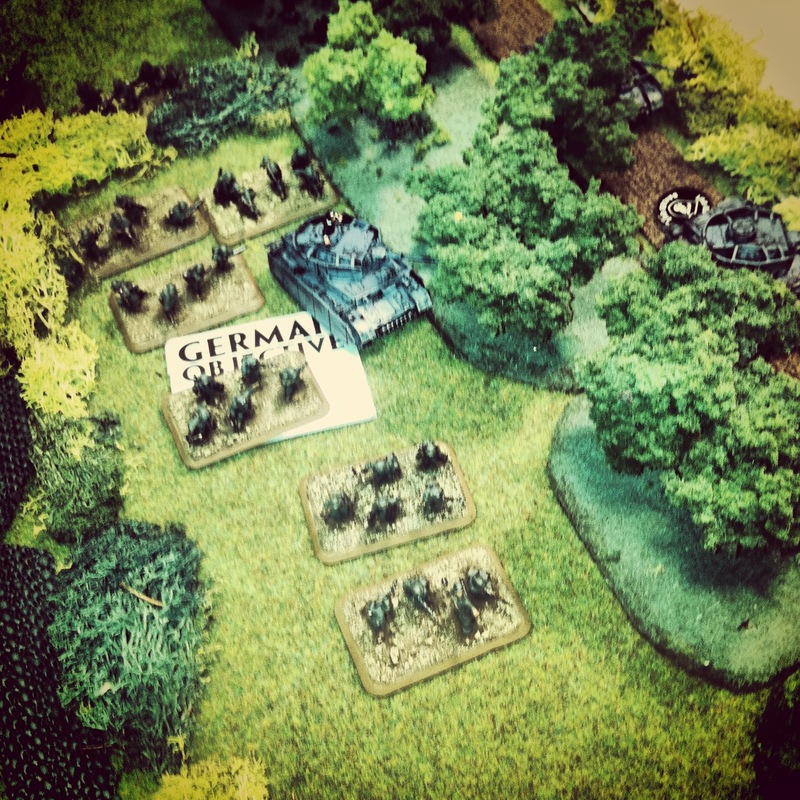 Keeping men moving and in the fight is key to victory, and this time around the German troops got the better of the day.